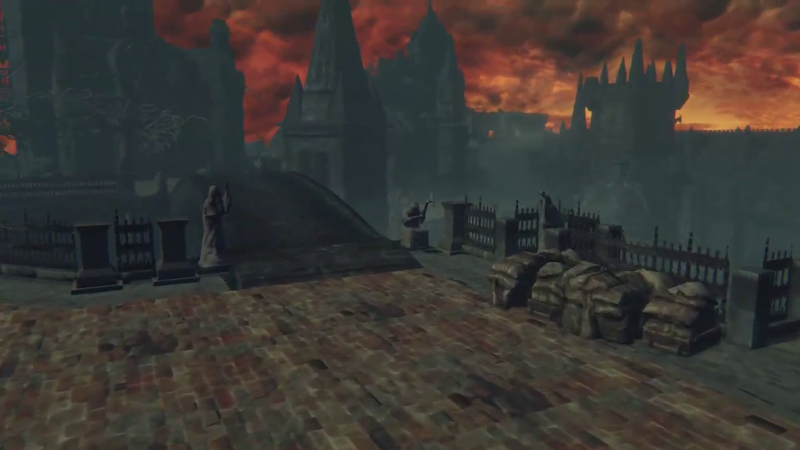 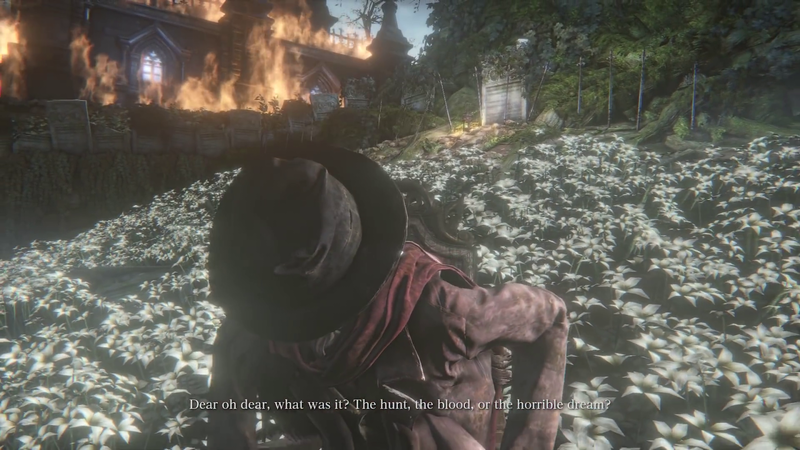 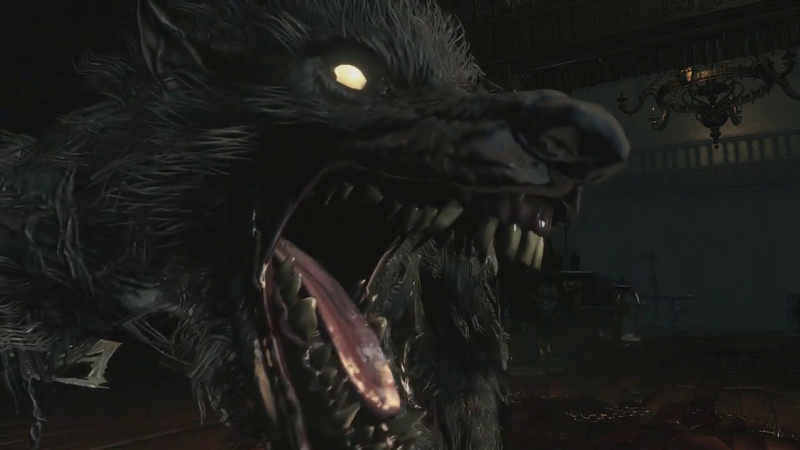 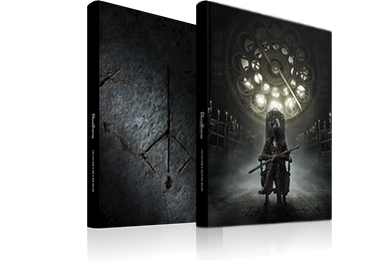 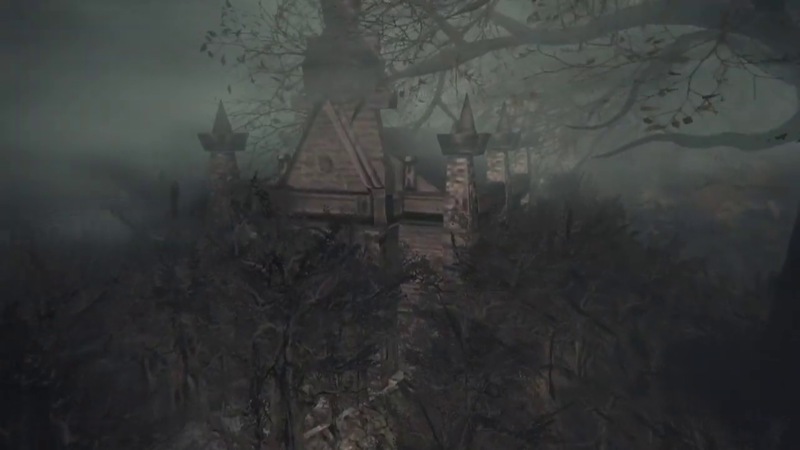 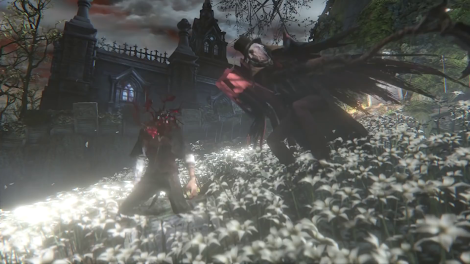 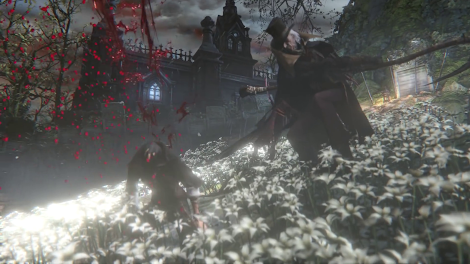 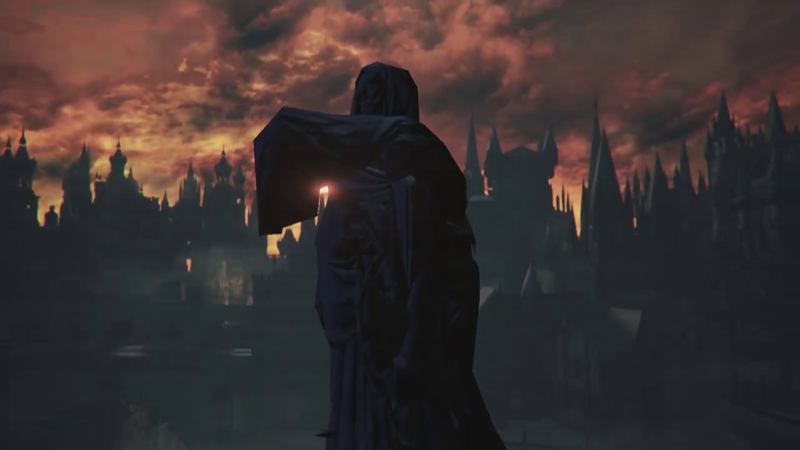 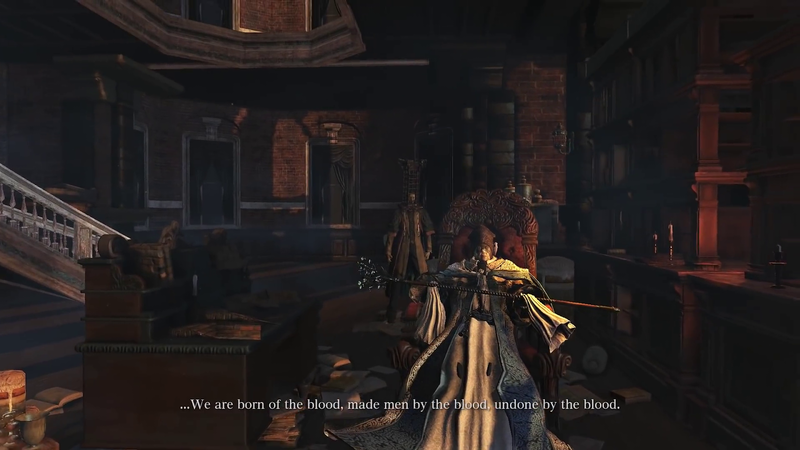 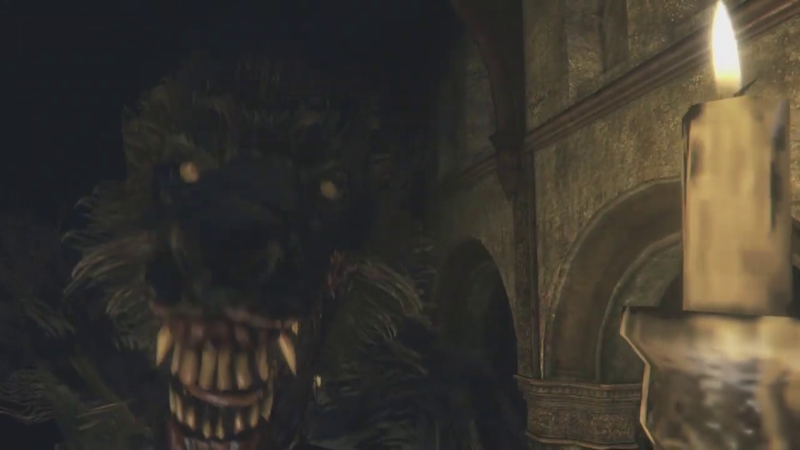 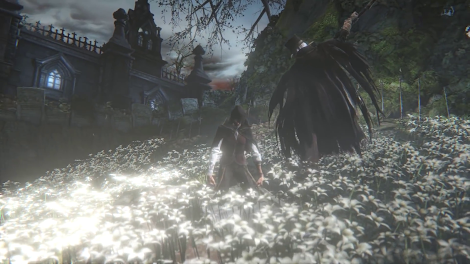 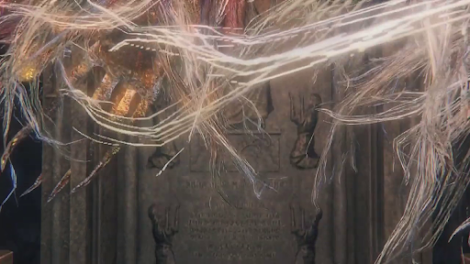 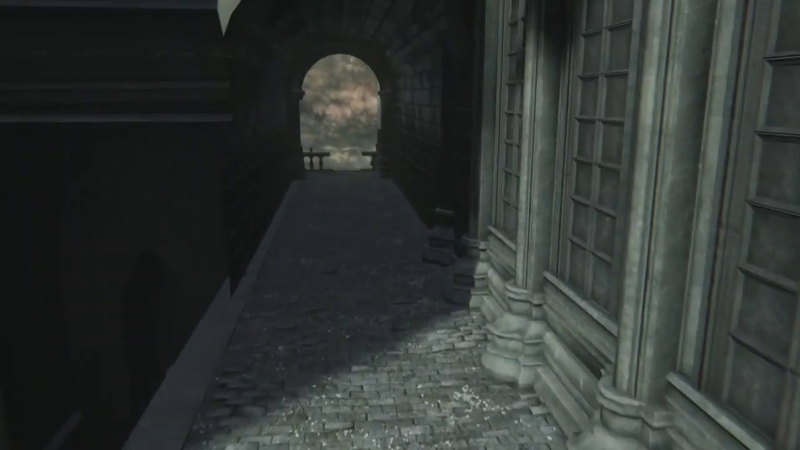 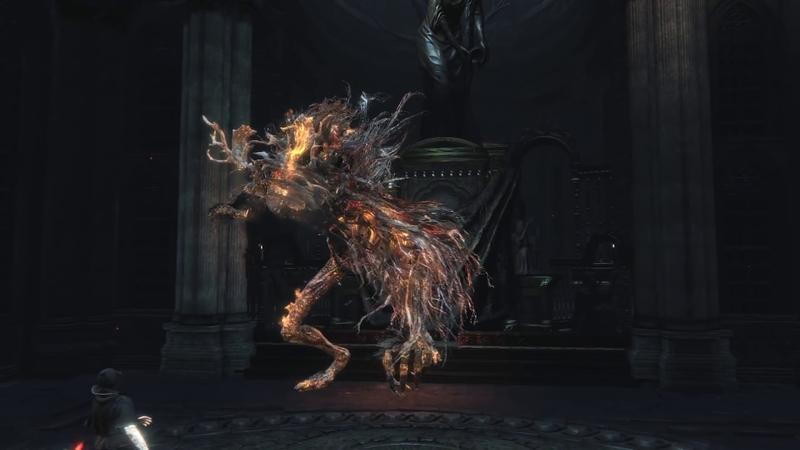 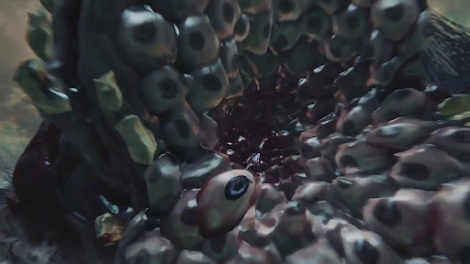 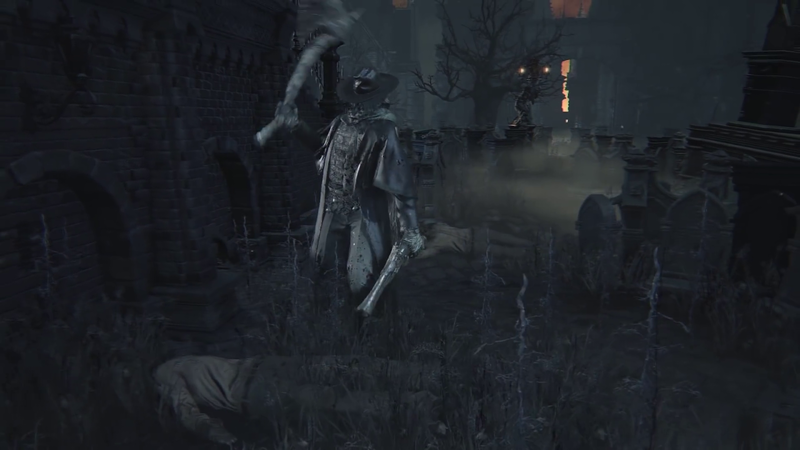 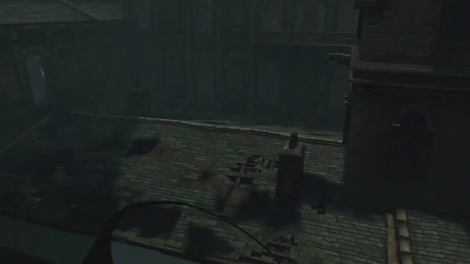 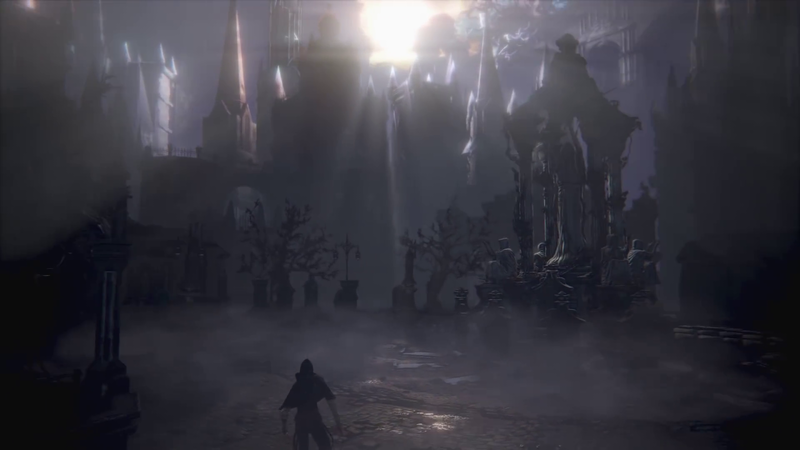 The ability to freely manipulate Bloodborne's camera is programmed into the game, and was used to create the more dynamic camera angles seen in the trailers and other promotional material. 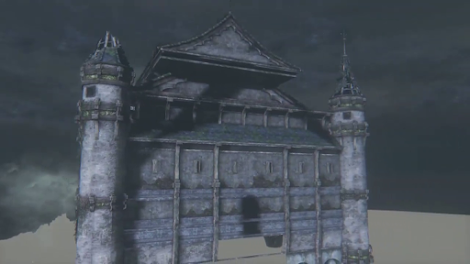 This feature is disabled in the release version of the game, but has been restored by Lance McDonald (youtube.com/warpchair). Combined with Lance's other game modifications, which remove clipping, gravity and enemy AI, it is possible to freely explore Bloodborne and view any area from any angle. Because the game renders objects based on their distance from the player character rather than the camera, parts of some structures appear to be missing when seen from certain distances and angles. 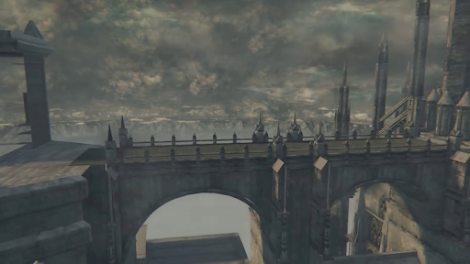 The broken bridge to Cathedral Ward, where the Monocular is acquired. The bridge leading to Gascoigne is below. Details of Iosefka's Clinic including the Scourge Beast, the unused second floor of the lobby, and the roof. 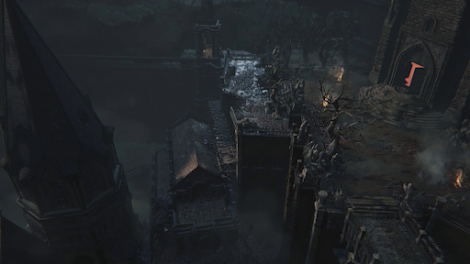 The low detail model of Old Yharnam. 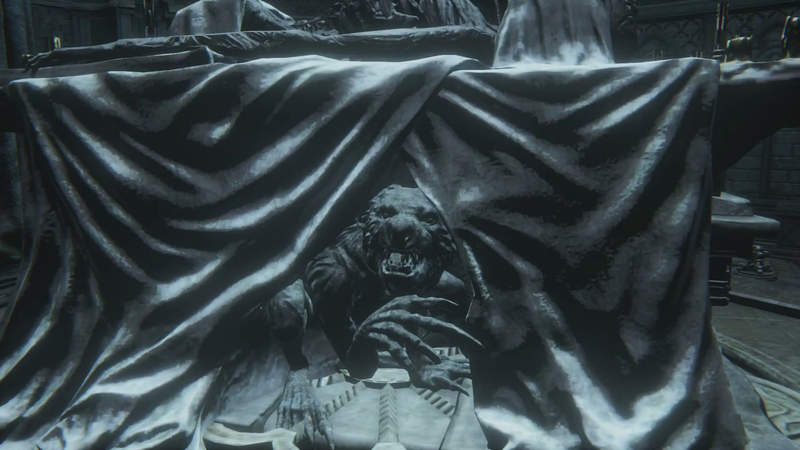 Oedon Tomb, Gascoigne's human model, and Gascoigne's beast model stored outside the map. 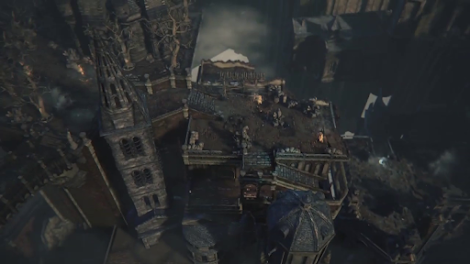 Upper Cathedral Ward and an aerial view of Cathedral Ward. 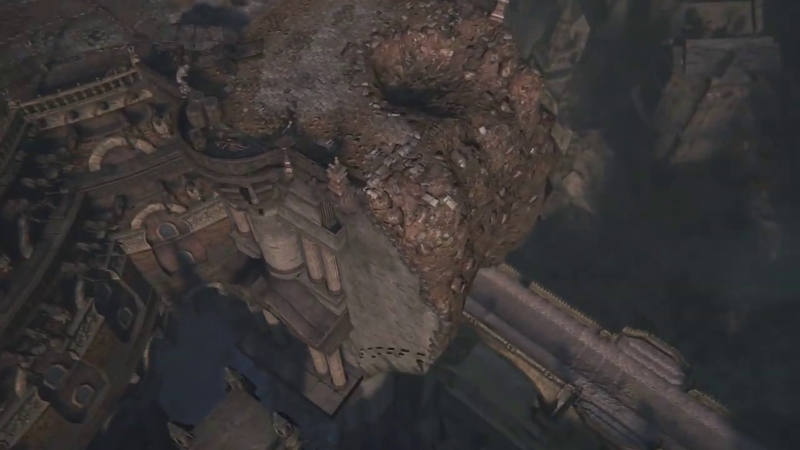 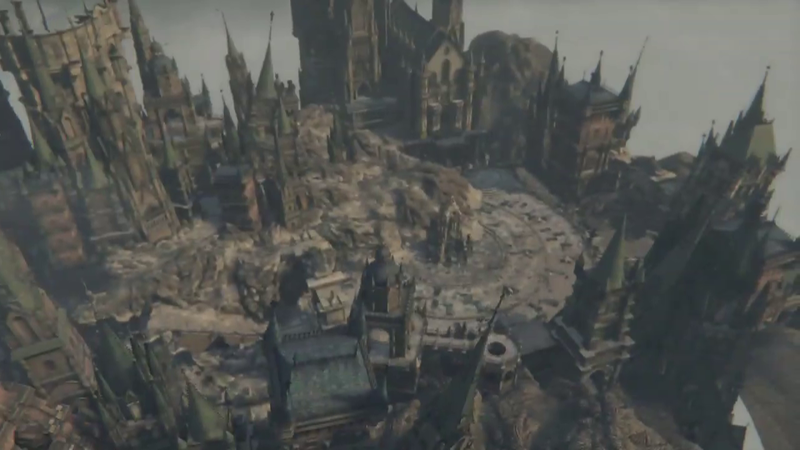 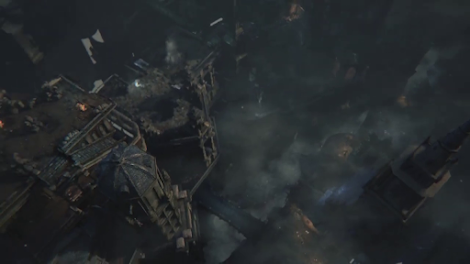 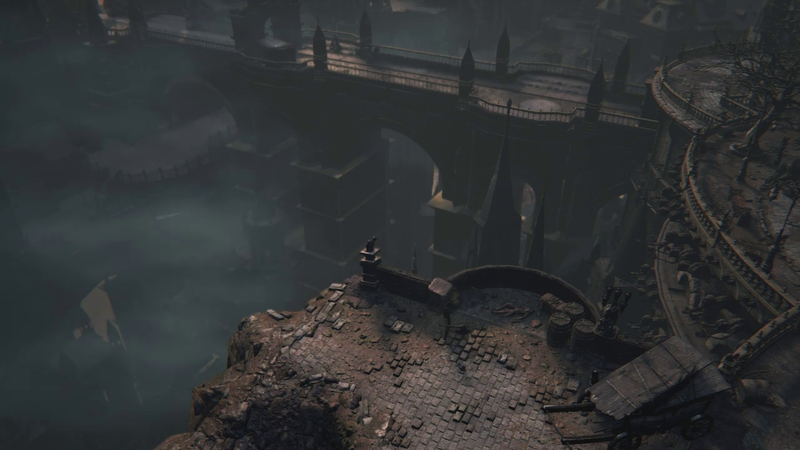 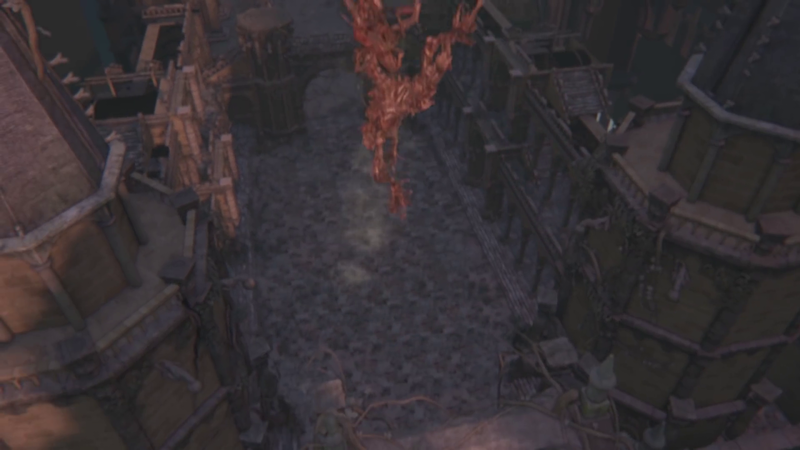 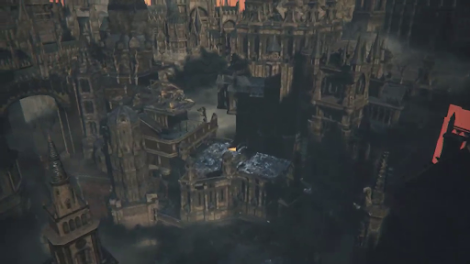 Aerial views of Old Yharnam. 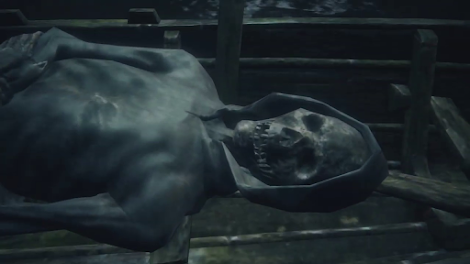 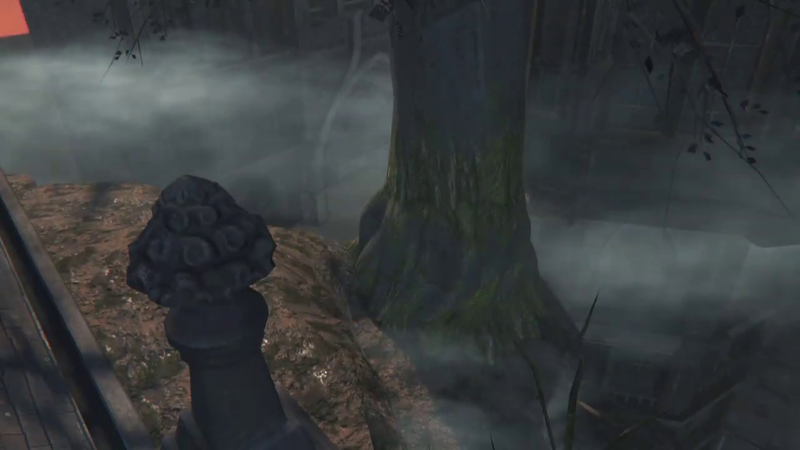 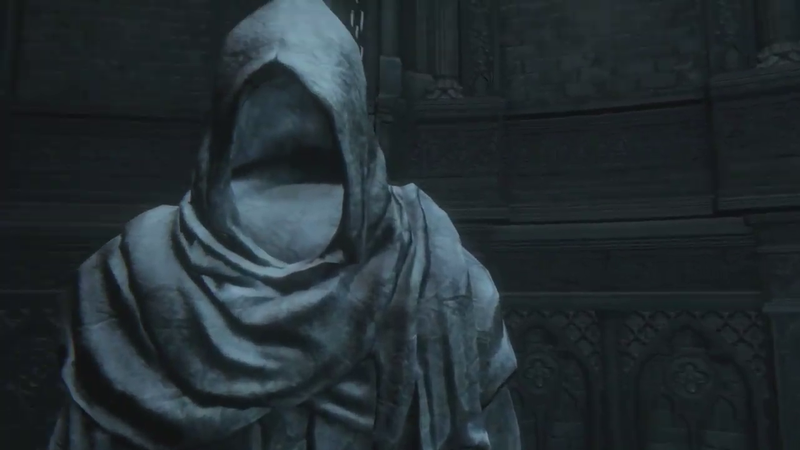 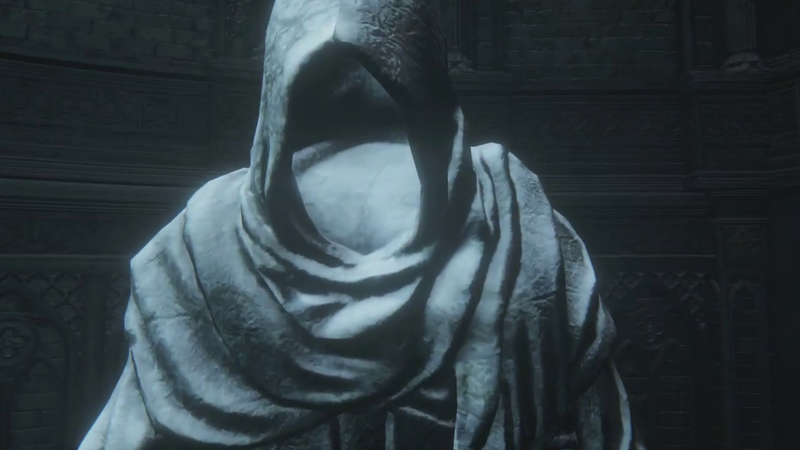 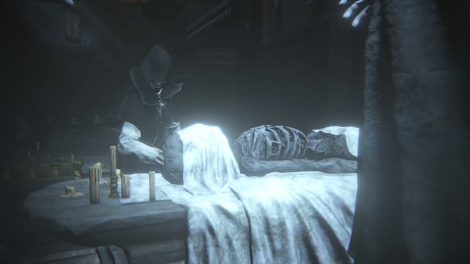 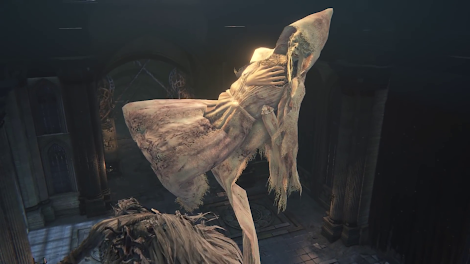 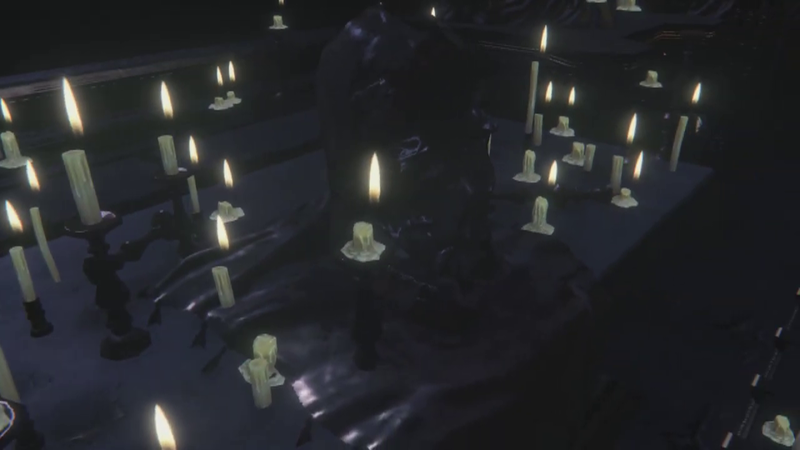 On close examination, the mysterious floating statue in Old Yharnam is revealed to be two statues clipping into each other. 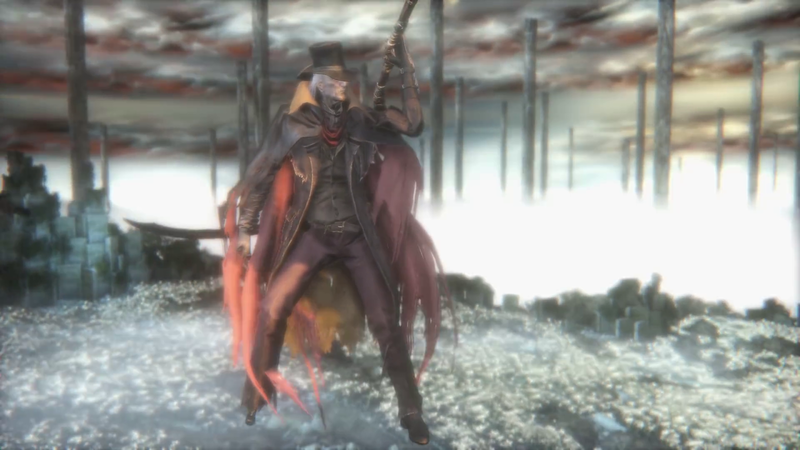 Djura's coat also floats next to him while he crouches by his gatling gun. Zooming into the Sun reveals an unseen part of its texture. 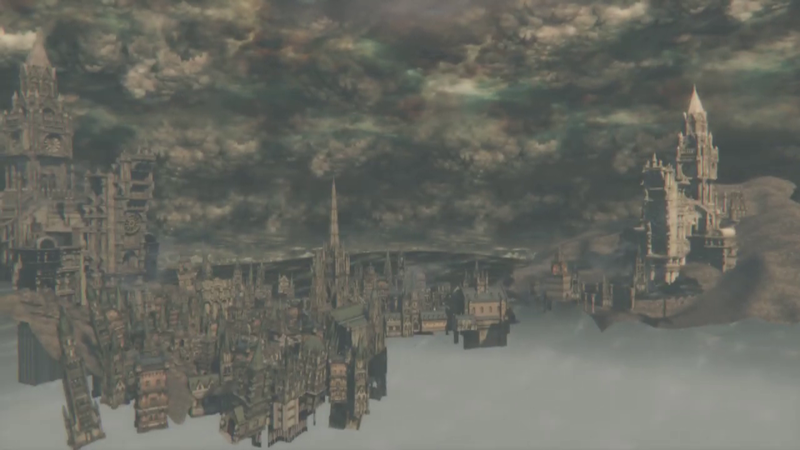 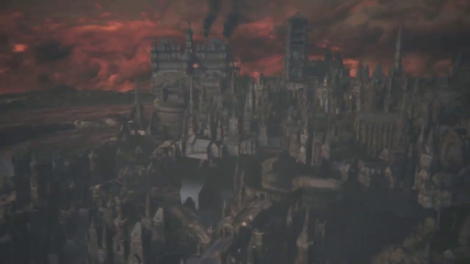 Facing Old Yharnam from this direction shows the city floating in the skybox. 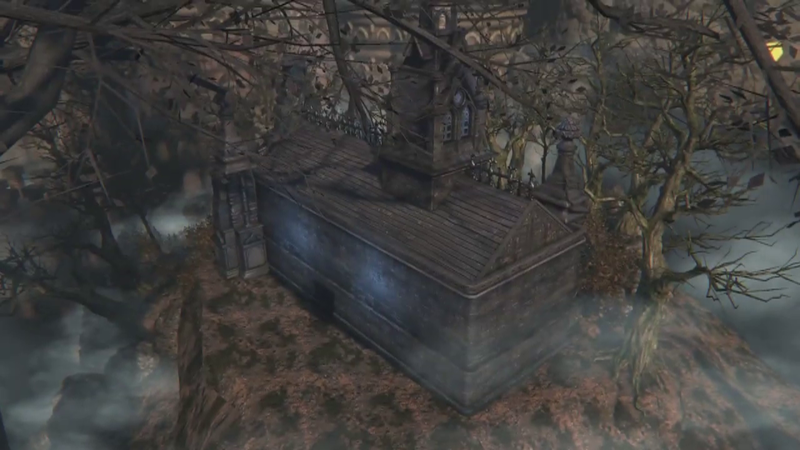 The low detail model of the Abandoned Old Workshop as seen from the Healing Church Workshop. 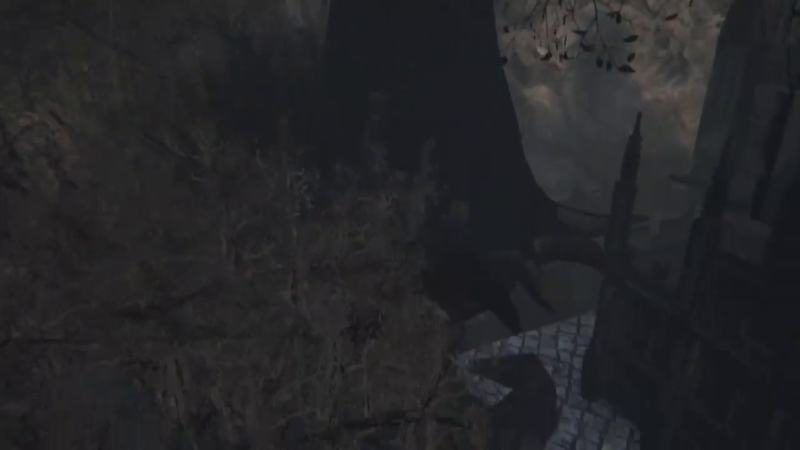 The base of the Great Tree is visible, along with a path that appears to have been an early method of access. 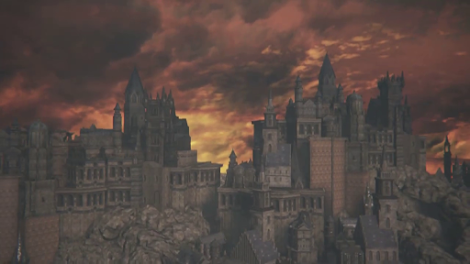 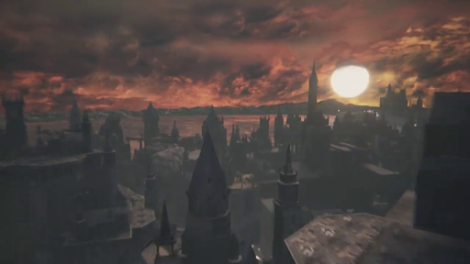 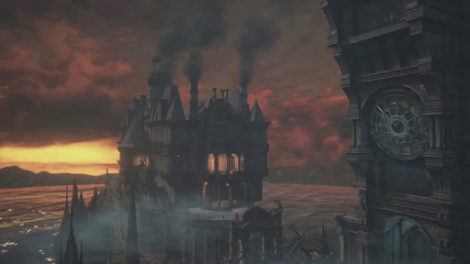 The Yharnam coast and skyline. Aerial views of the lower part of Cathedral Ward. A closer look at the Abandoned Old Workshop, including the roof, the Great Tree, and the back of the building. 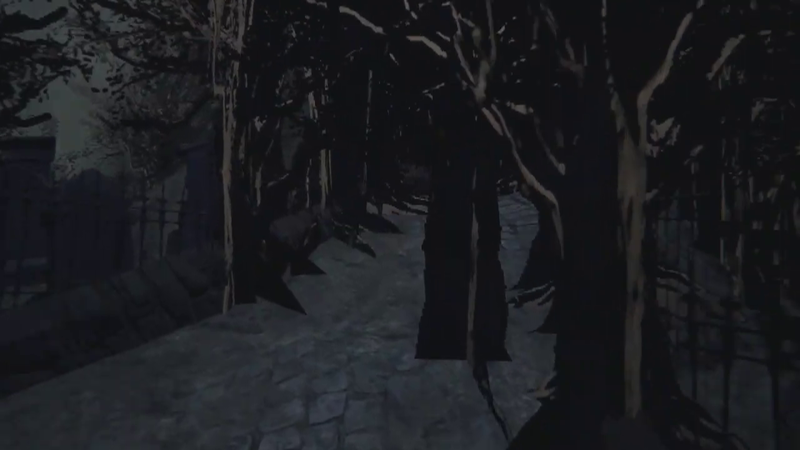 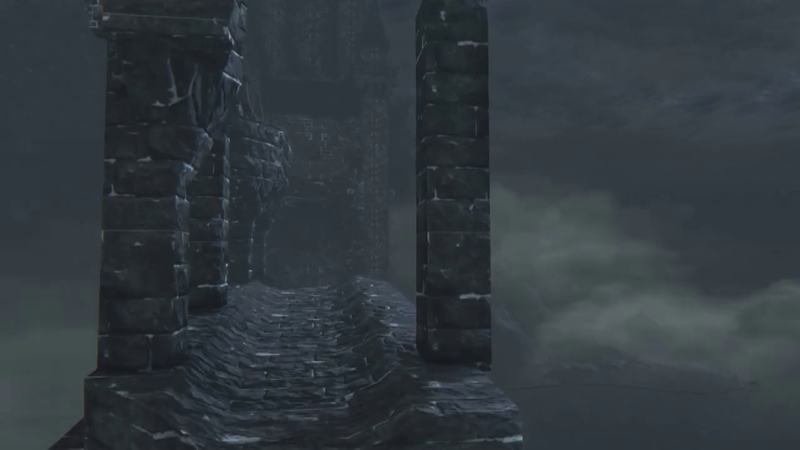 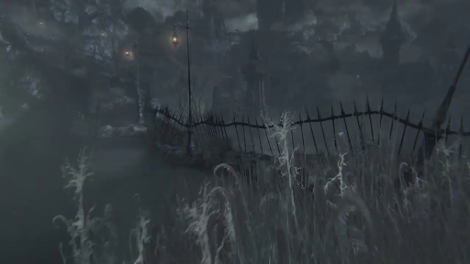 The low-detail model of the path from Cathedral Ward to Yahar'gul as seen from Cathedral Ward. Yahar'gul itself does not load from this angle. 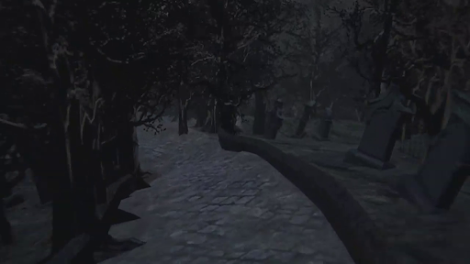 A different low-detail model of the same path, as seen from Upper Cathedral Ward. This reveals a slightly different design, with a gargoyle in place of the well and a staircase leading down to the chuch with the Amygdala. The church is clipping inside other pieces of geometry, so it is possible it was relocated. 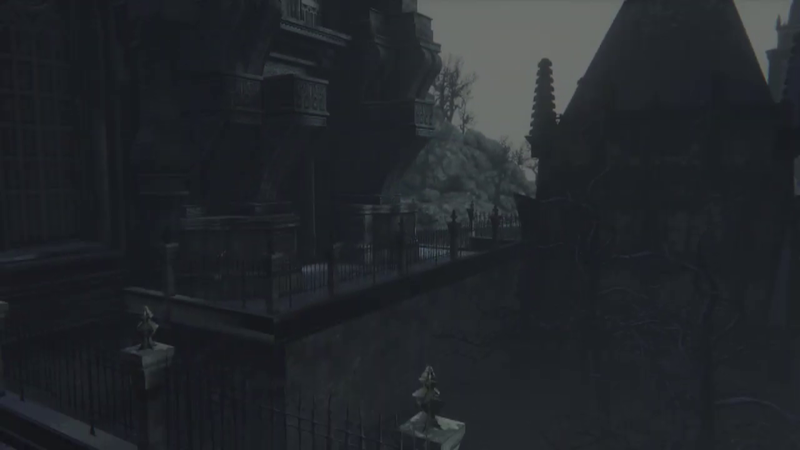 Copies of Old Yharnam used as background scenery. The low-detail model of Cathedral Ward seen from Upper Cathedral Ward features a door leading to the lower area that connects to Forbidden Woods. 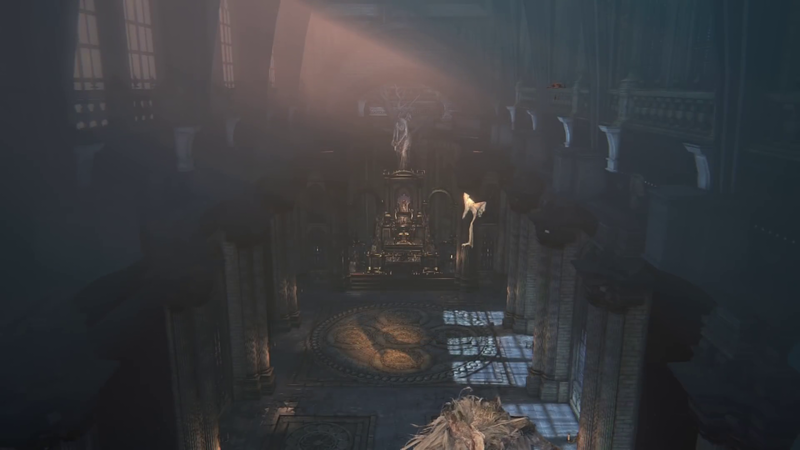 The low detail model of the Grand Cathedral reveals the original path to Yahar'gul. 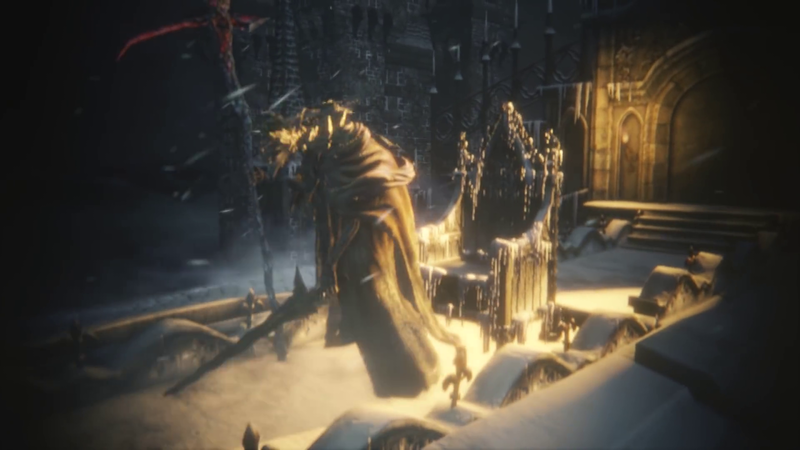 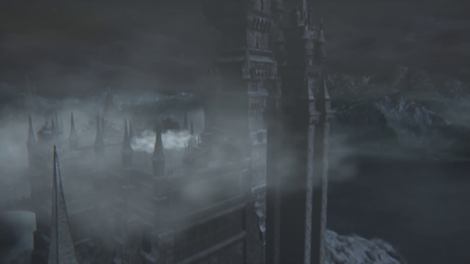 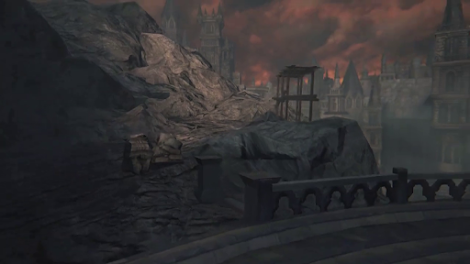 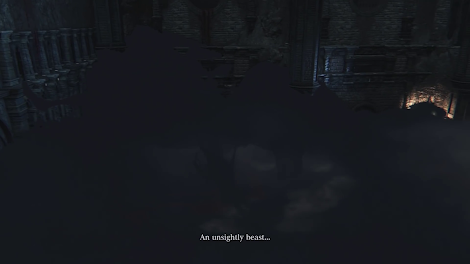 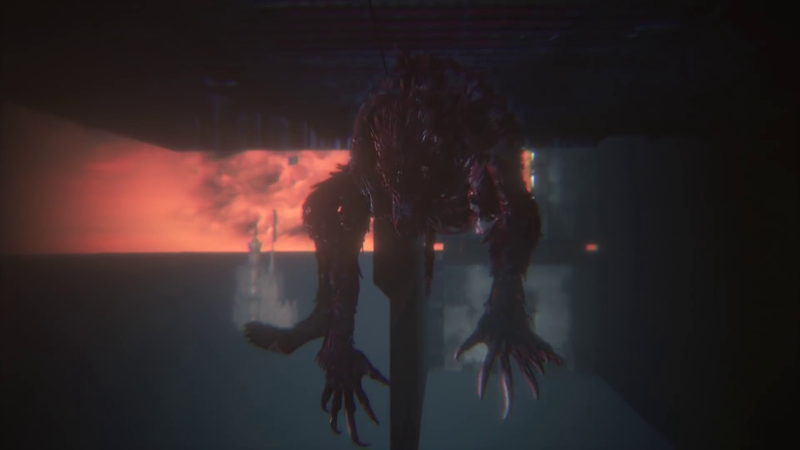 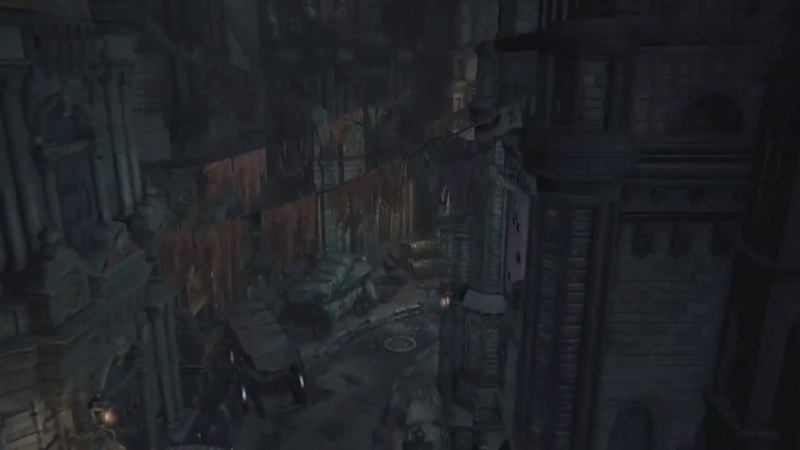 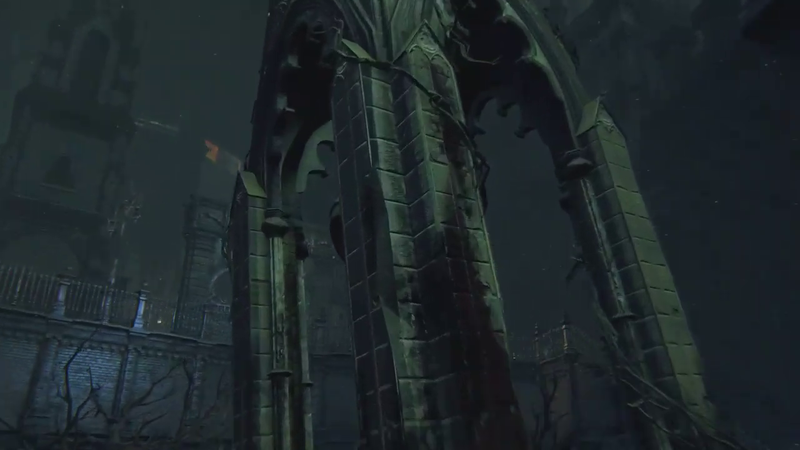 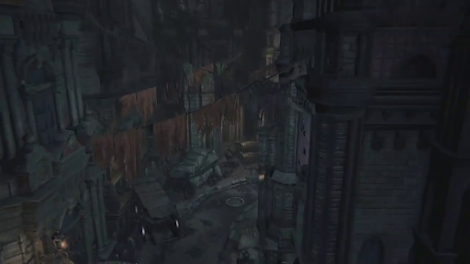 A barrier prevents the player character from reaching Yahar'gul by simply walking around the Grand Cathedral, and the other side is reached using an elevator from Lumenflower Gardens. 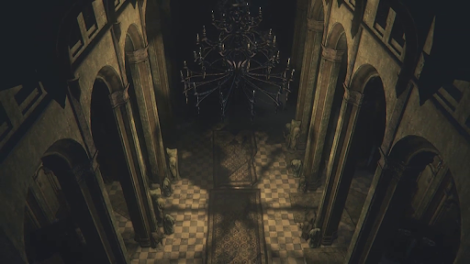 The low detail interior of the Grand Cathedral viewed from Upper Cathedral Ward. 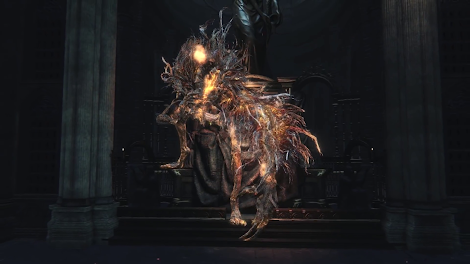 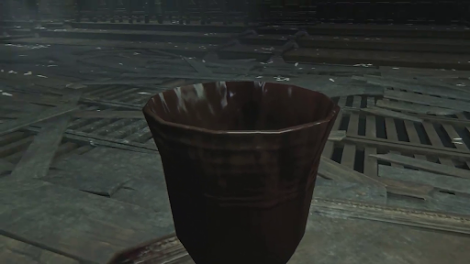 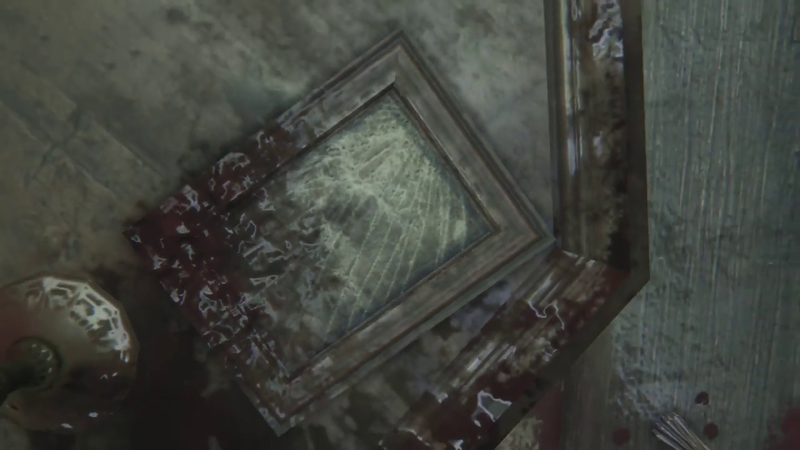 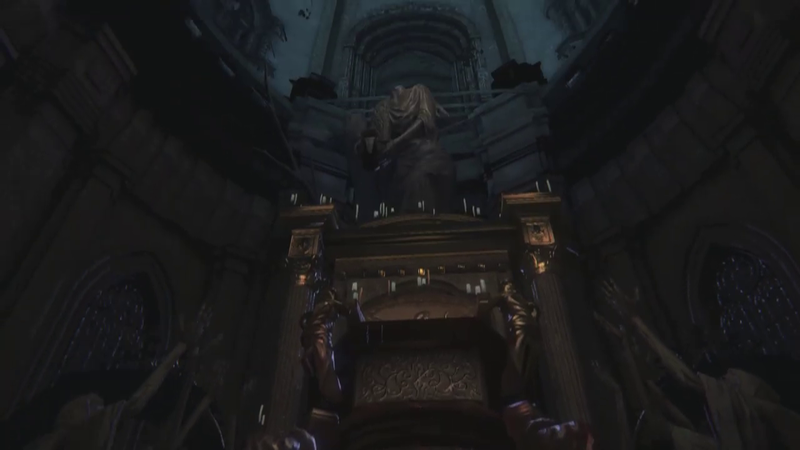 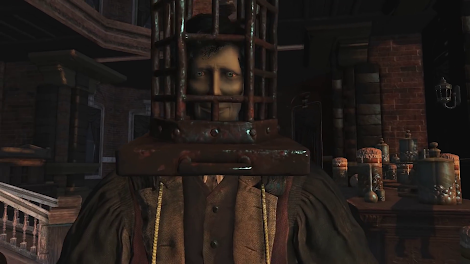 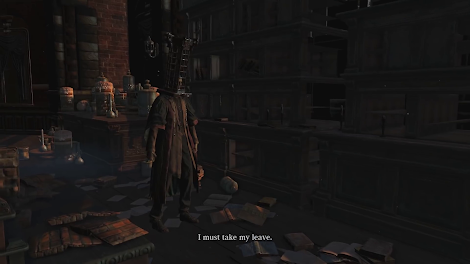 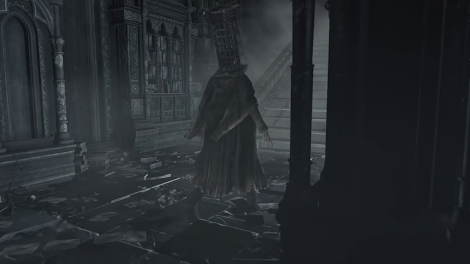 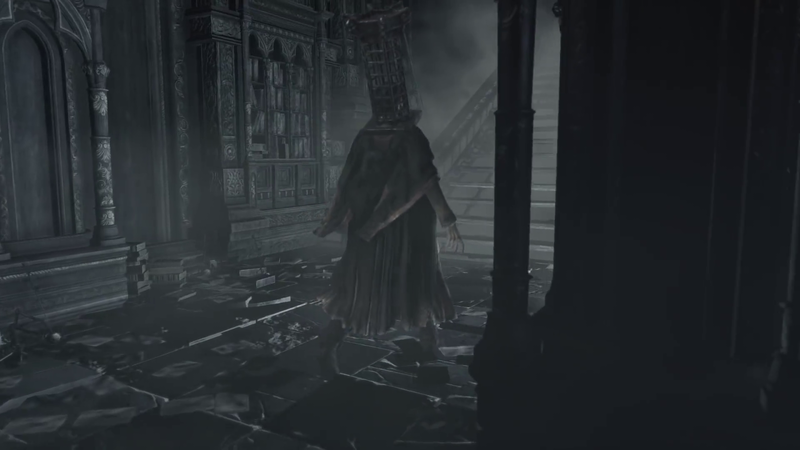 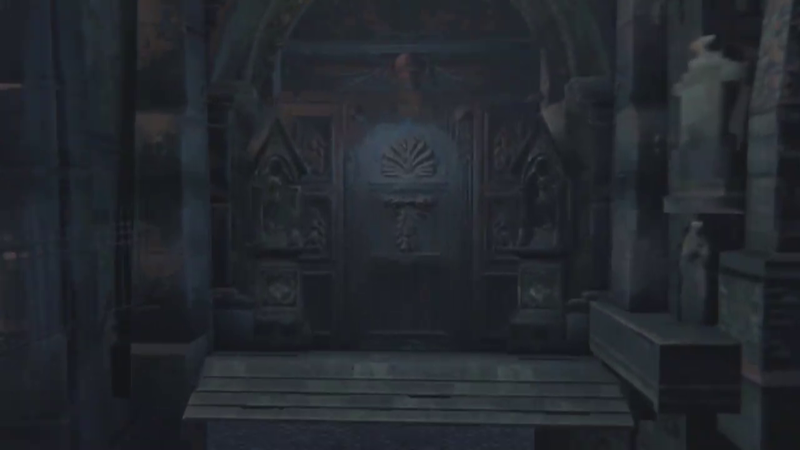 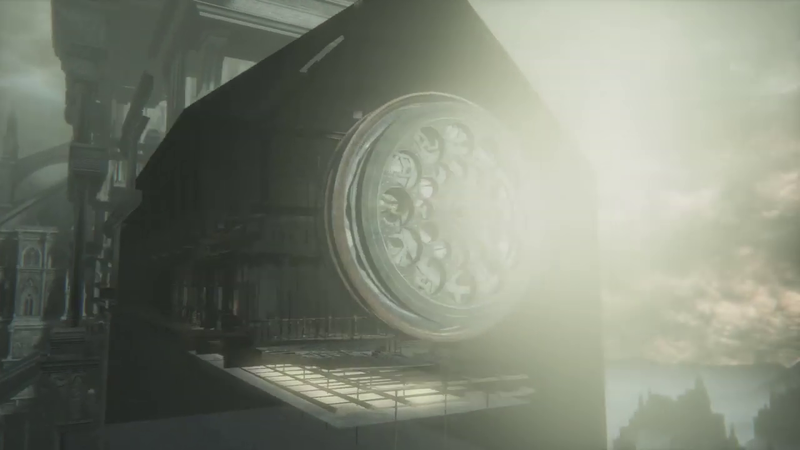 The lantern is always shown to be broken regardless of its current state, Laurence's skull is on the altar, and there are no Amygdala statues on the staircase. 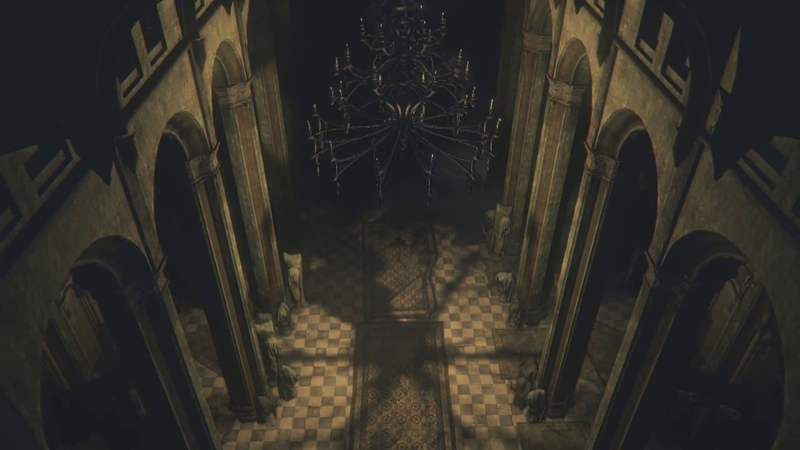 The Upper Cathedral Ward chandeliere and the Scourge Beasts hanging from it. The Altar of Despair and the eyes of Ebrietas. 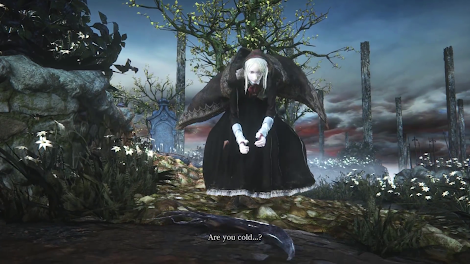 Vicar Amelia, simply a Bell Maiden with her robe turned white. The Grand Cathedral Altar. 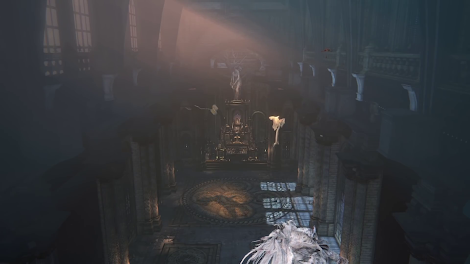 Unlike when viewed from Upper Cathedral Ward, Laurence's skull is not present when viewed from Cathedral Ward. 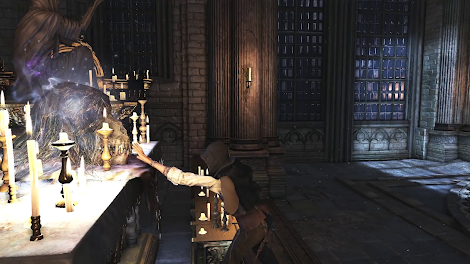 A bloodstained copy of the statue, used during Amelia's transformation cutscene, is stored inside the altar before use. The unused and inacessible road near Hemwick. 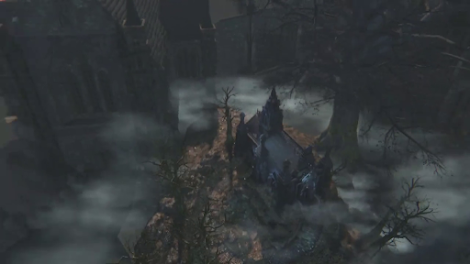 Witch's Abode, including the interior of one of the towers on the side. 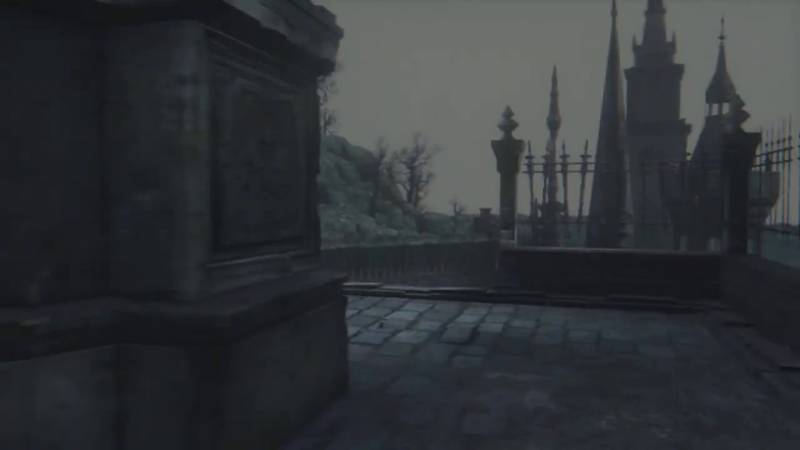 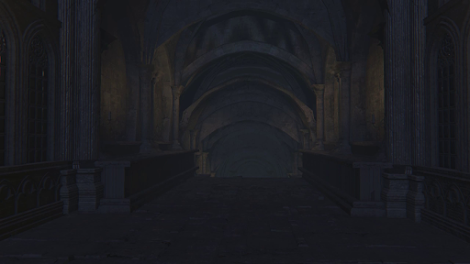 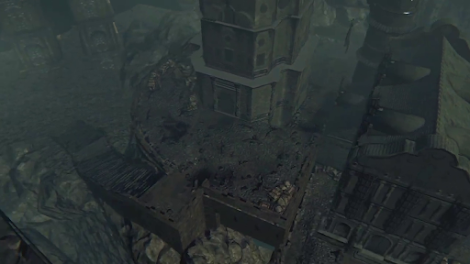 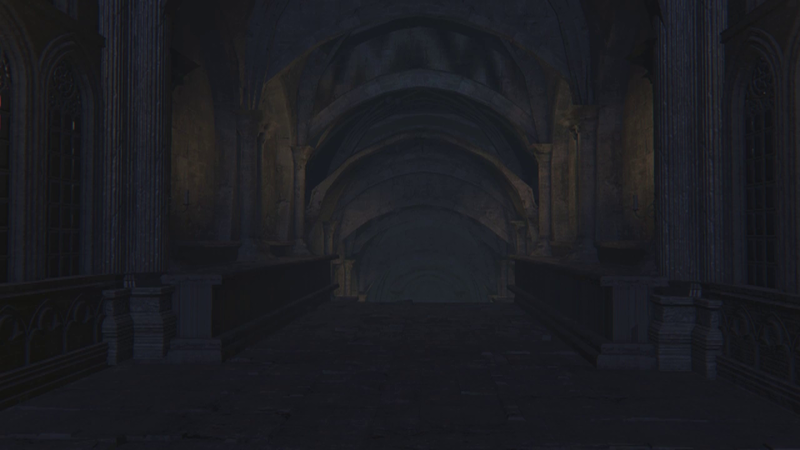 The bridge to Cainhurst, and the unused door that originally led to Annalise' throne room. 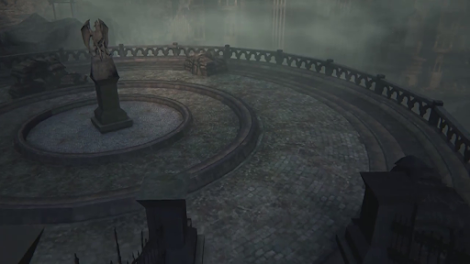 Aerial views of the Cathedral bridge and the Plaza in the Hunter's Nightmare. 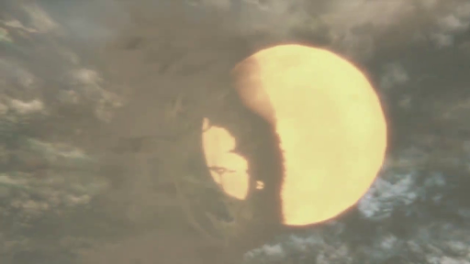 A closeup of the "sun" in the Hunter's Nightmare, showing that it is two objects overlapping. 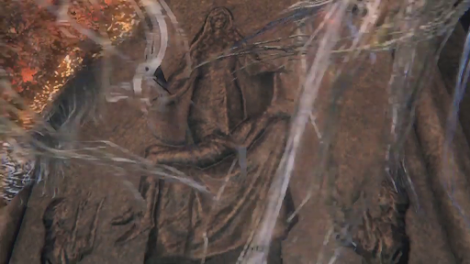 Behind Laurence's plinth is a relief depicting a similar Pieta pose. 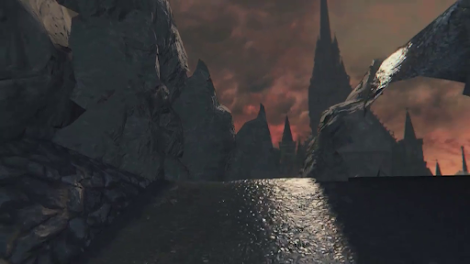 Distant views of Hunter's Nightmare, showing the two Cathedrals. 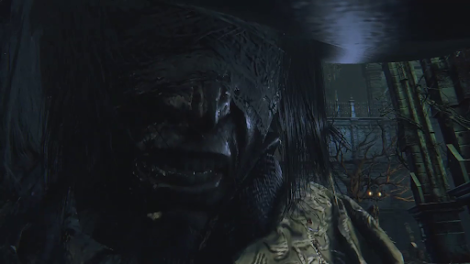 Details of Ludwig's two heads. Details of the Surgery Altar. An unused path below the Lumenflower Gardens bridge. 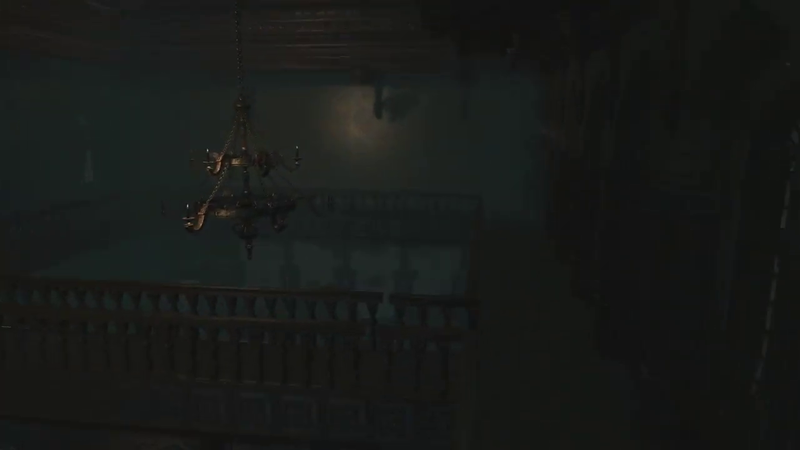 It leads to a drop that would have allowed the player character to fall on to the balcony where the patient is tending to the Lumenflower. 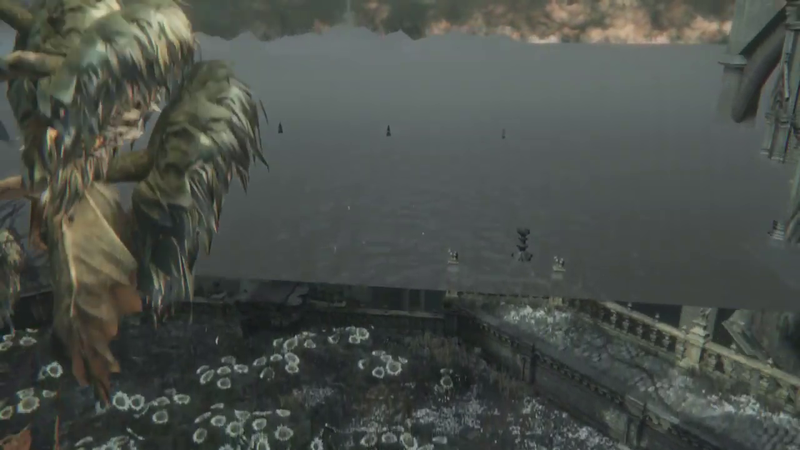 Entering the Astral Clocktower causes the sea from the Fishing Hamlet to load and envelop the Research Hall. 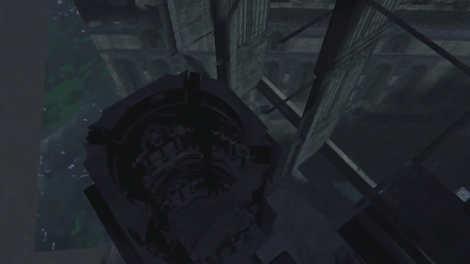 Details of the Astral Clocktower, showing the top of the tower and the dial. The Hunter's Nightmare as seen from the Fishing Hamlet. 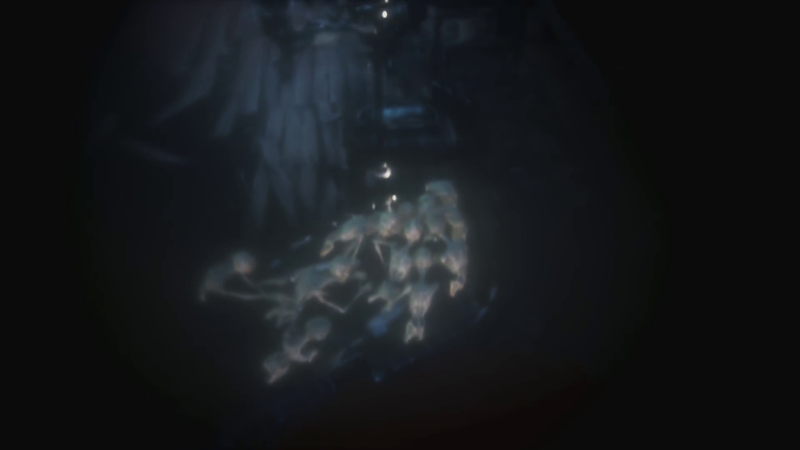 Details of the corpses in the Fishing Hamlet. Details of the Snail Women. 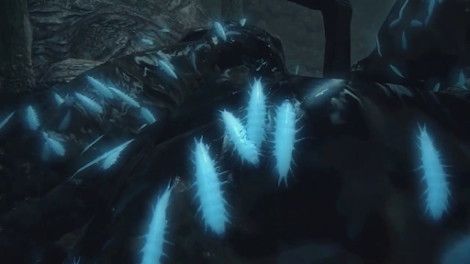 When inside their shells, their bodies are still present, but compressed. From a distance, their hair loads but is not attached to their heads and floats above their shells. 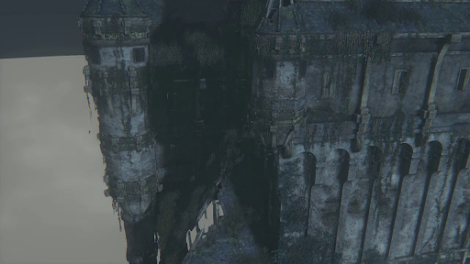 The low-detail model of Kos. 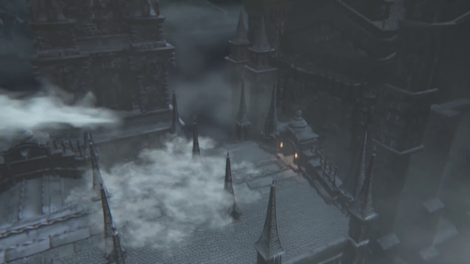 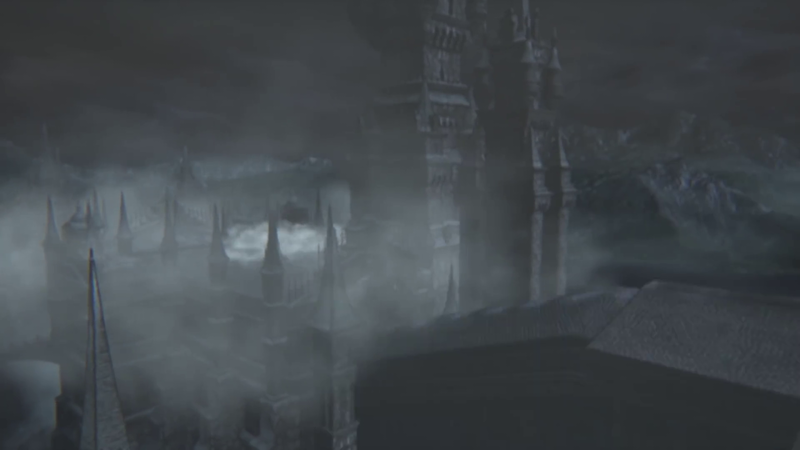 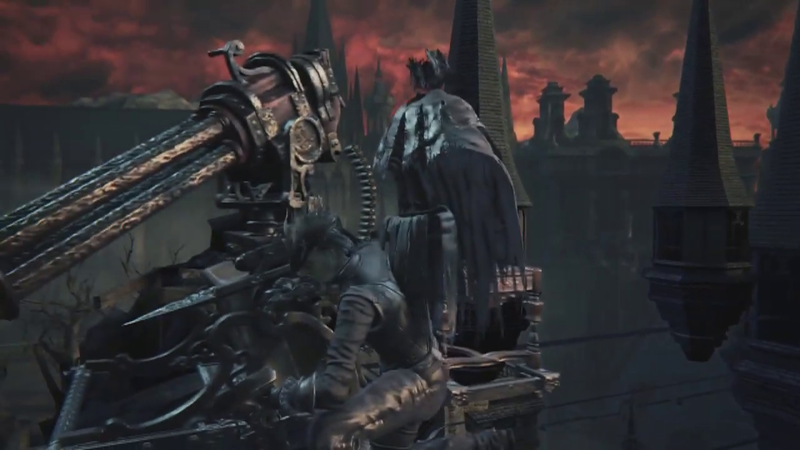 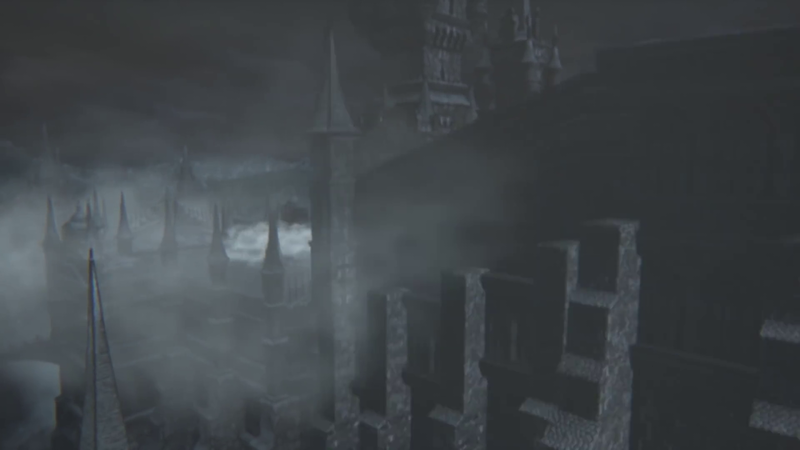 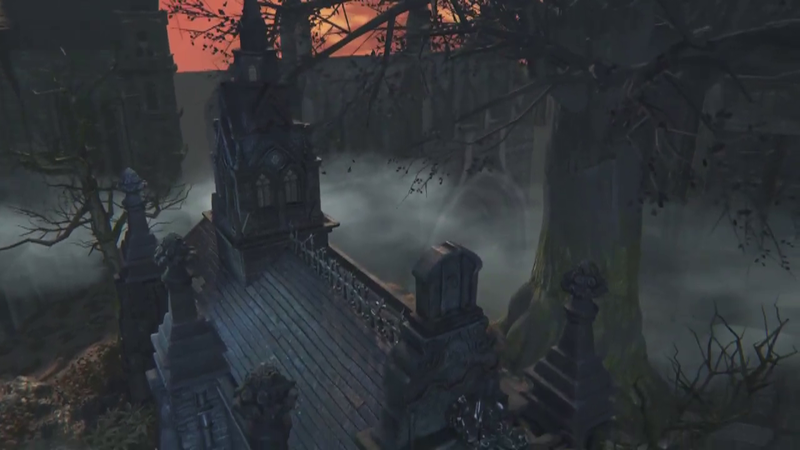 Bloodborne's inbuilt freecam can also be used during cutscenes. 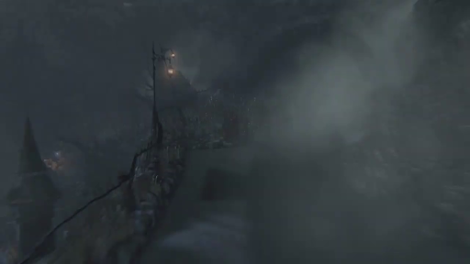 The following images were captured from a video made by Lance McDonald. 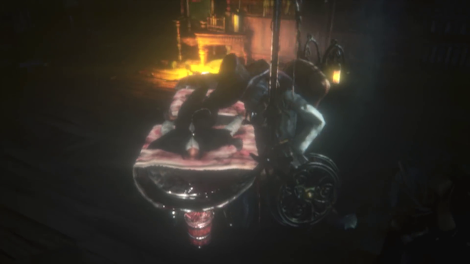 The Blood Minister leaning over the player character is achieved by making the Minister's entire model, including his chair, rise up and rotate forward. 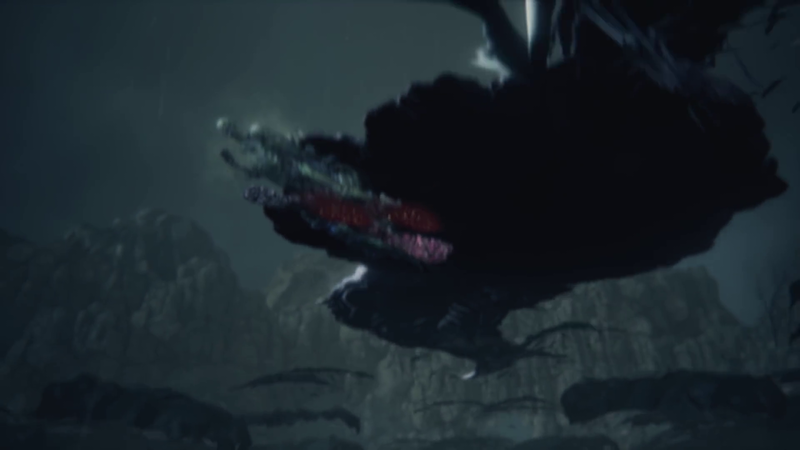 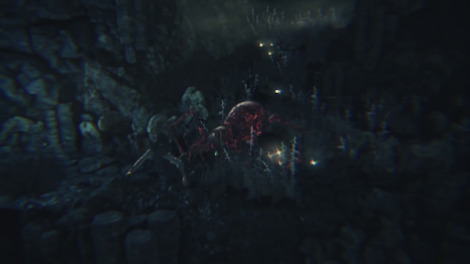 The effect of the Scourge Beast rising from the pool is blood is accomplished by having the Scourge Beast begin underneath the floor and then slowly move upward. The Messengers which climb on the player character are also stored below the floor and rise through it. 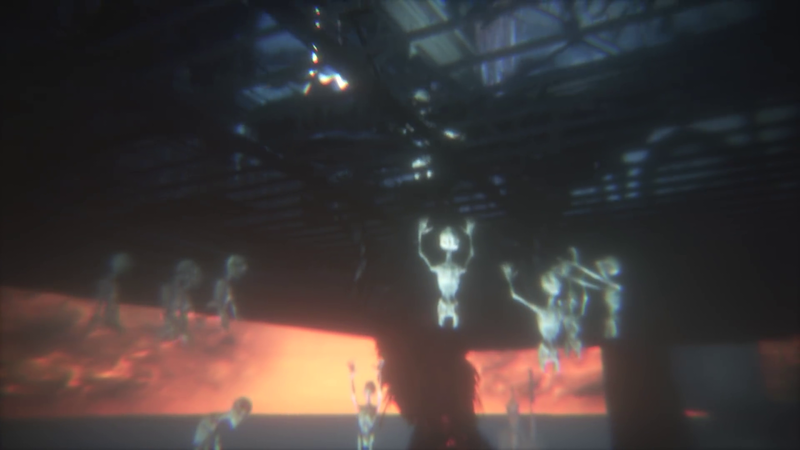 Viewing the scene from above rather than from the player character's POV reveals there are ten Messengers. 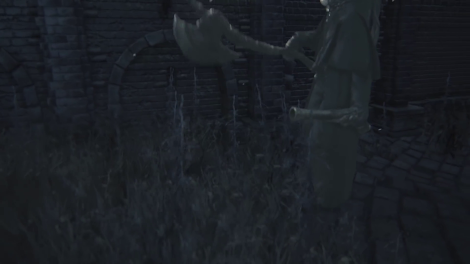 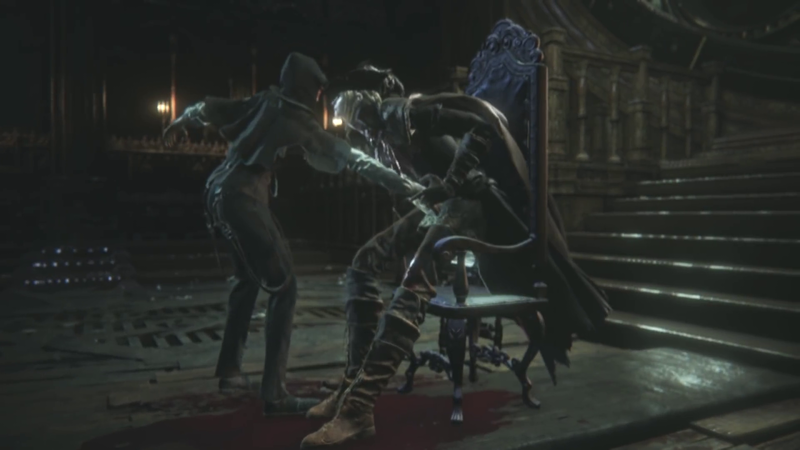 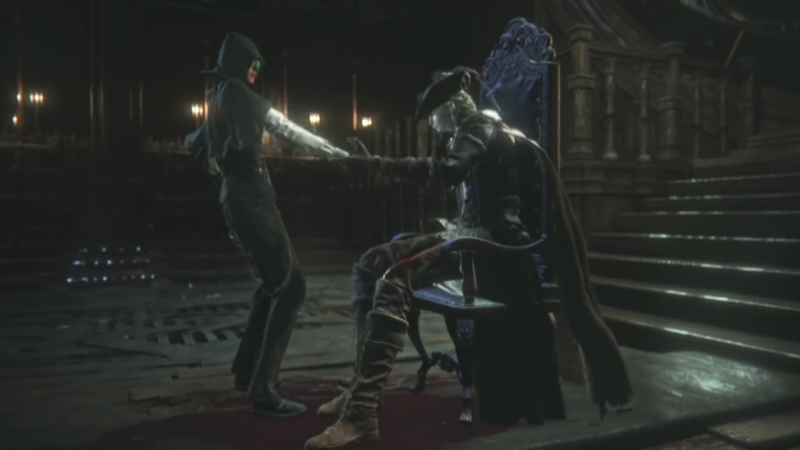 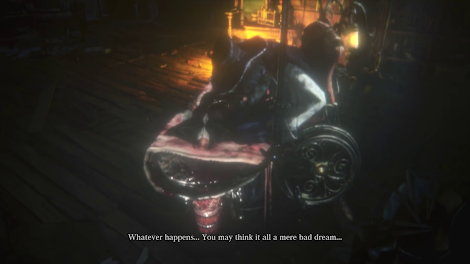 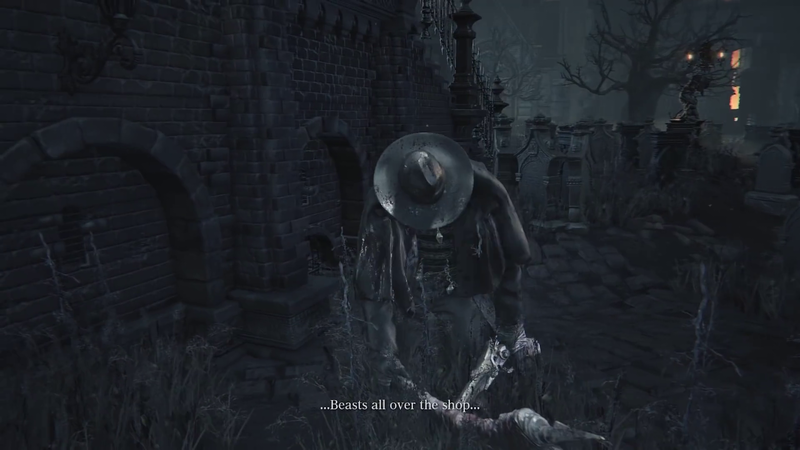 The Yharnamite being dismembered by Gascoigne is initially not present, and only appears when Gascoigne's axe is readied. When the angle on Gascoigne changes in preparation for his "Beasts all over the shop..." line, his model changes position during the cut. View of the player entering Oedon Chapel from the opposite angle. 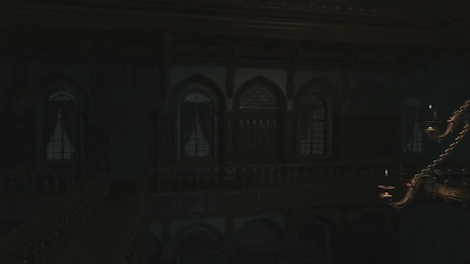 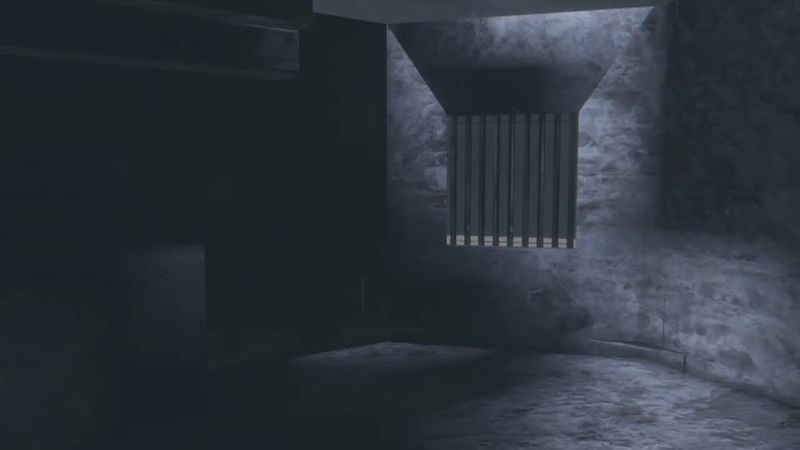 The shadow cast by Amelia in the cutscene is accomplished by having Amelia's model change position so that it is high above the floor, in the path of the sunlight coming in through the top floor windows. 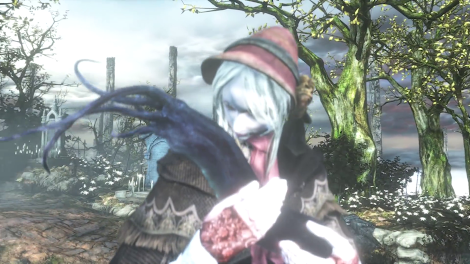 Changing camera angles also shows that Amelia's "human" model is, in fact, a Bell Maiden with white robes and flesh-coloured gloves. Her beast form is also loaded in as soon as the cutscene starts, in preparation for her transformation. 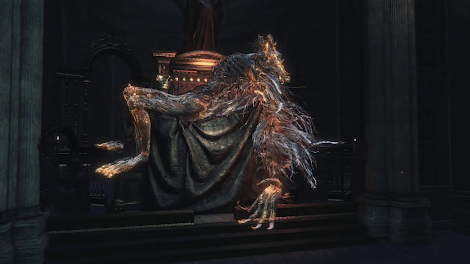 Amelia's transformation in silhouette is accomplished by gradually moving her beast model so that it overlaps her human model, causing her shadow to transform. 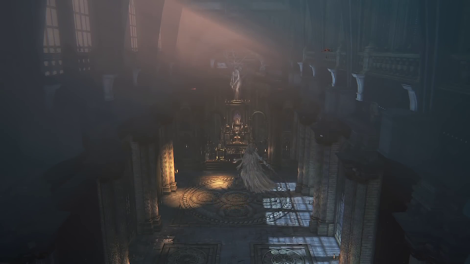 The shots of Amelia's beast form are accomplished by shifting the model around the cathedral floor prior to the battle beginning. 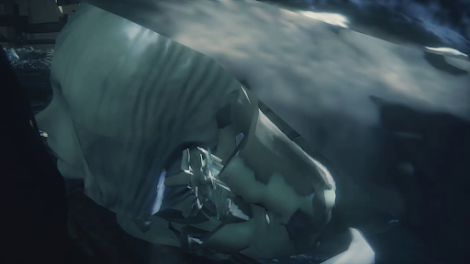 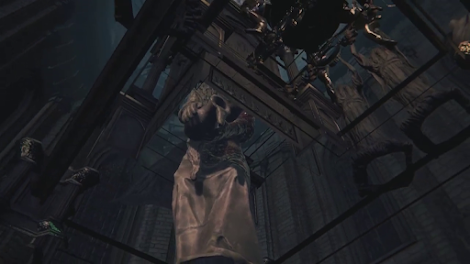 The cutscene begins with the player character touching Laurence's skull, after which the camera moves through the floor. 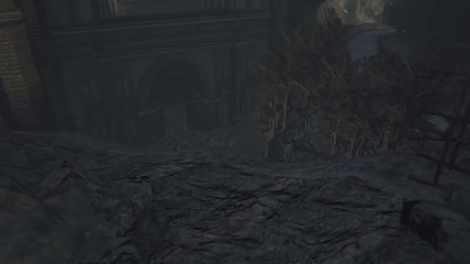 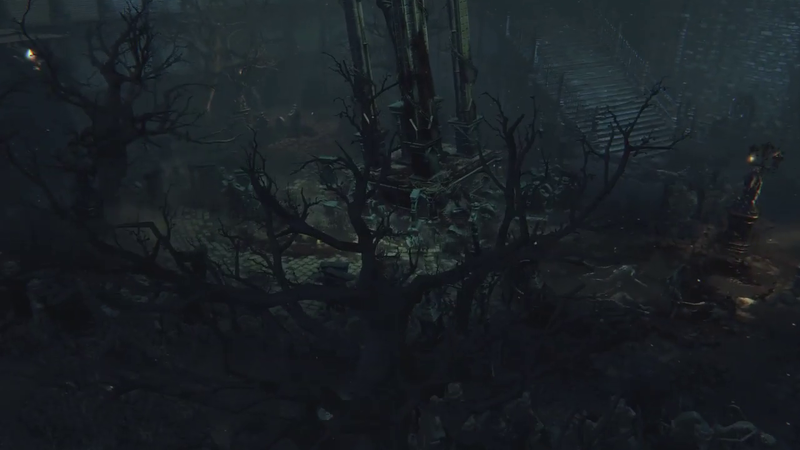 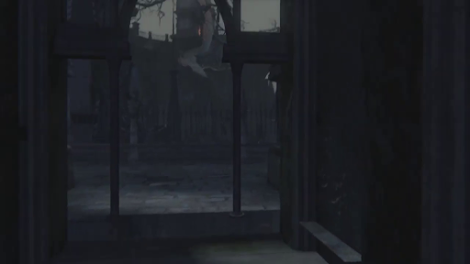 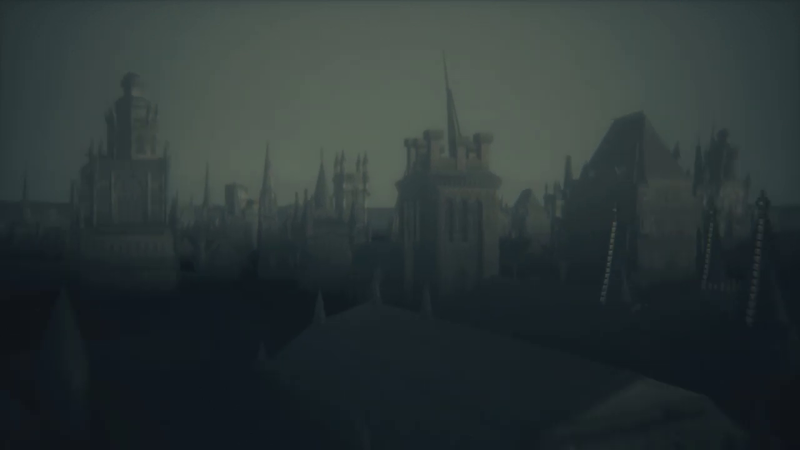 This reveals that the "Byrgenwerth" in the cutscene is a small map located beneath the Grand Cathedral. 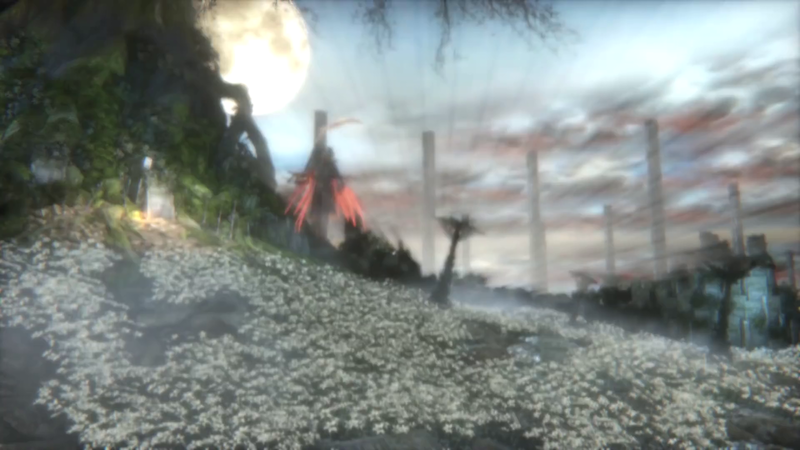 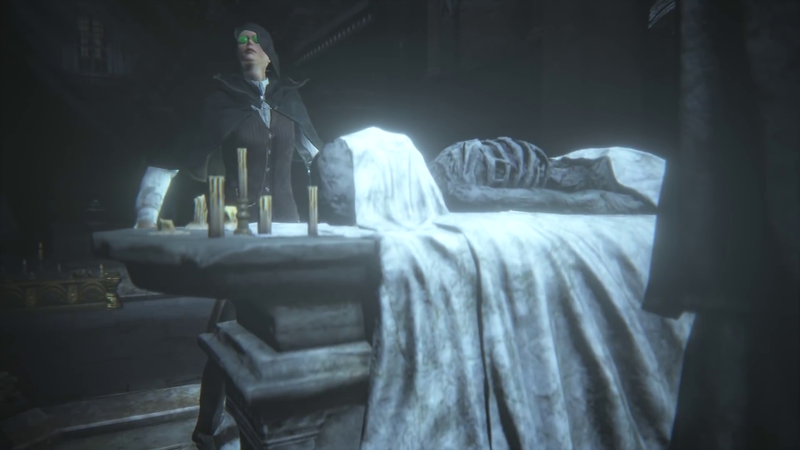 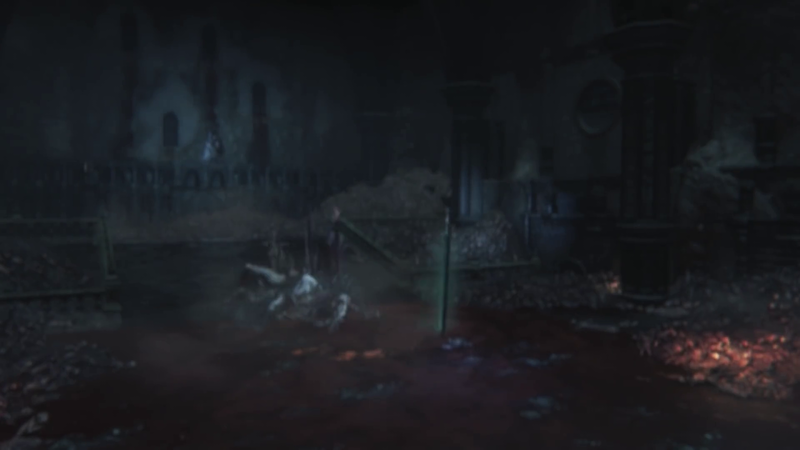 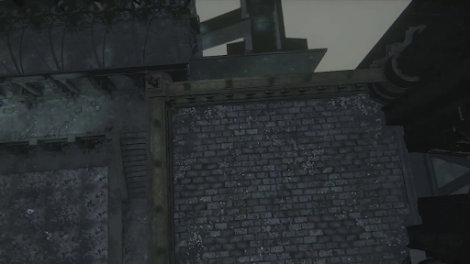 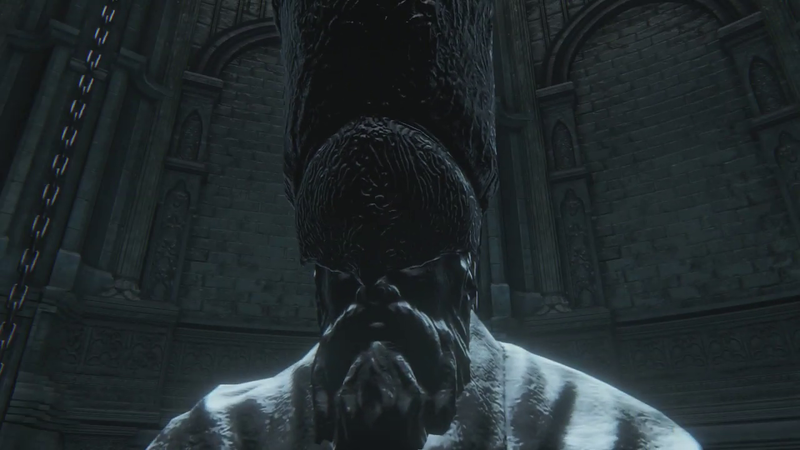 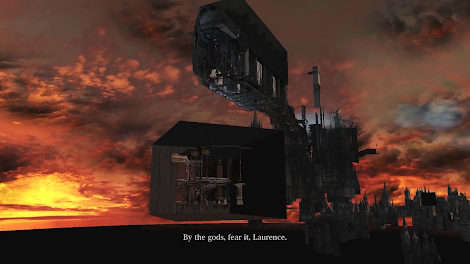 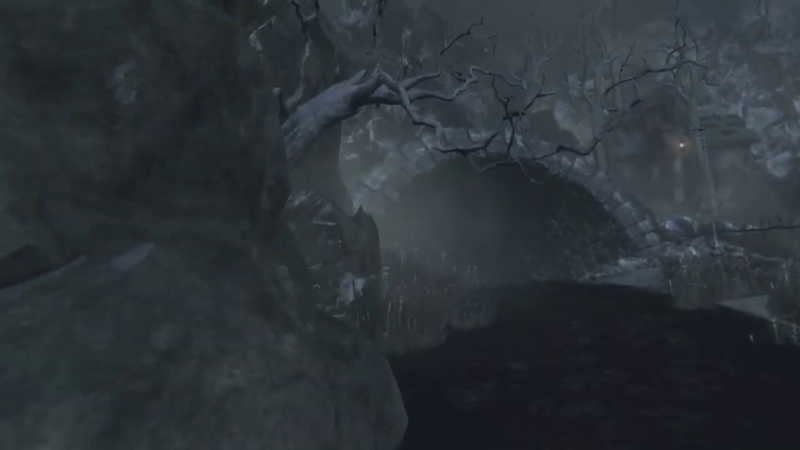 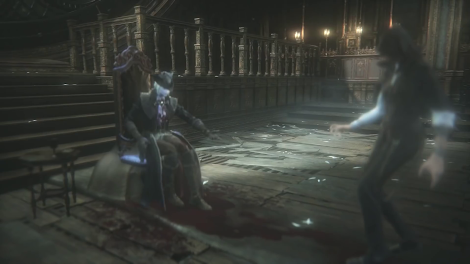 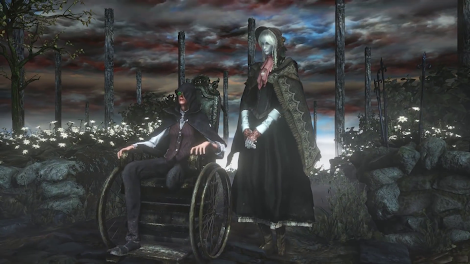 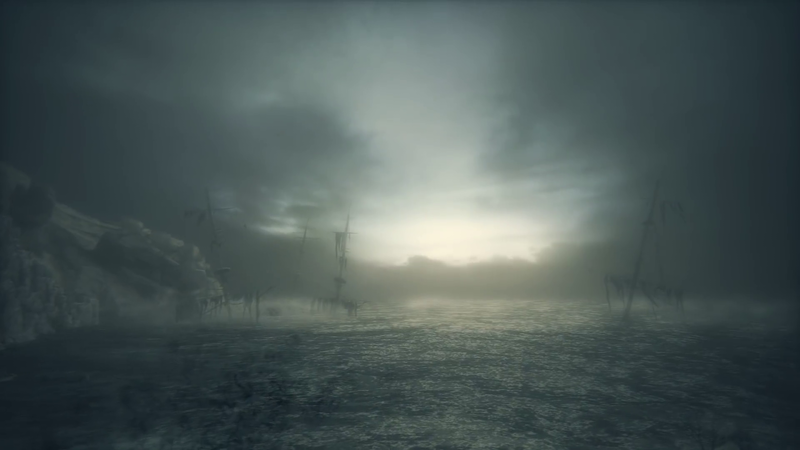 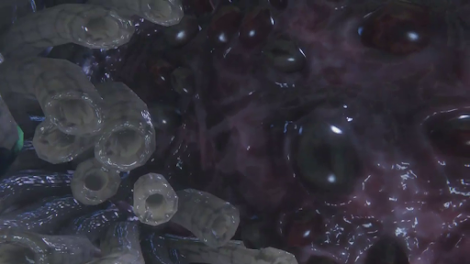 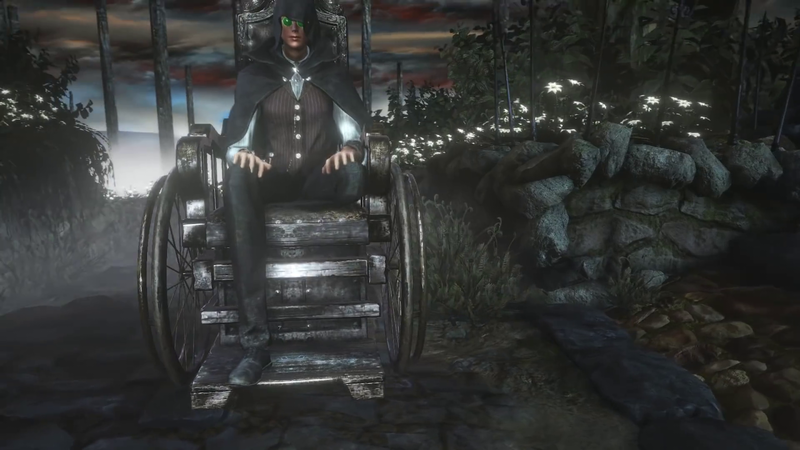 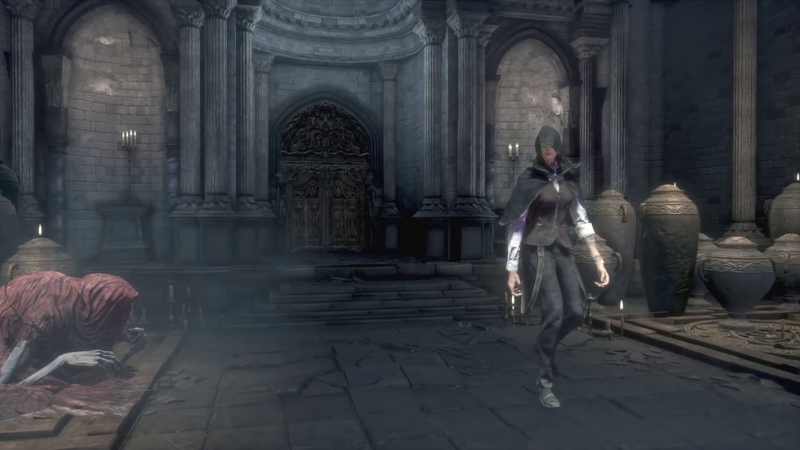 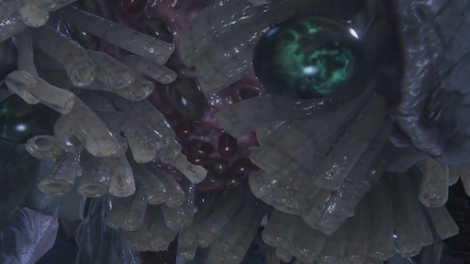 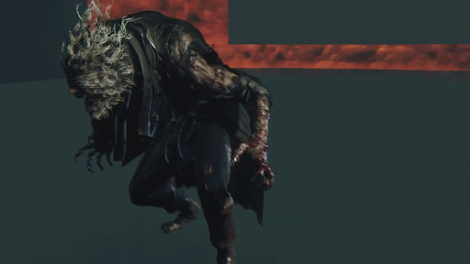 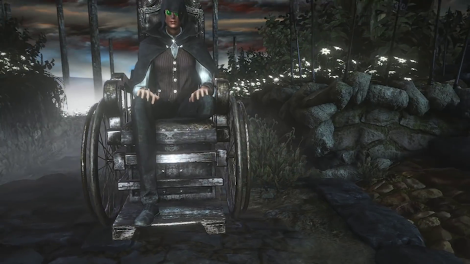 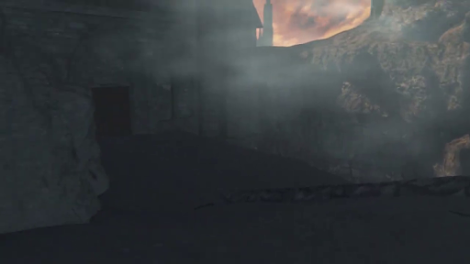 Although Laurence is never seen in the cutscene itself, a "Laurence" character is present, represented by Micolash. 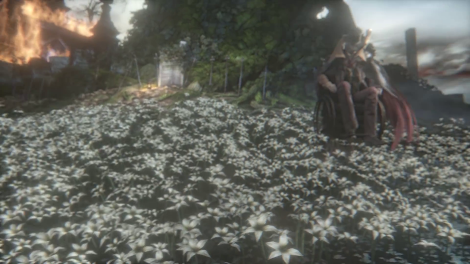 "Laurence" and Willem change places during the scene, depending on the kind of shot required. 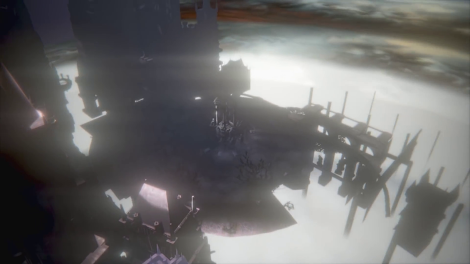 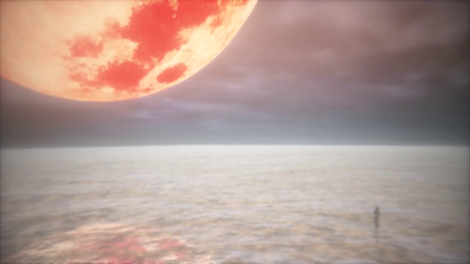 The Red Moon's descent and the player character's collapse shown from different angles. The Red Moon itself is a flat image which partially clips through the sky. 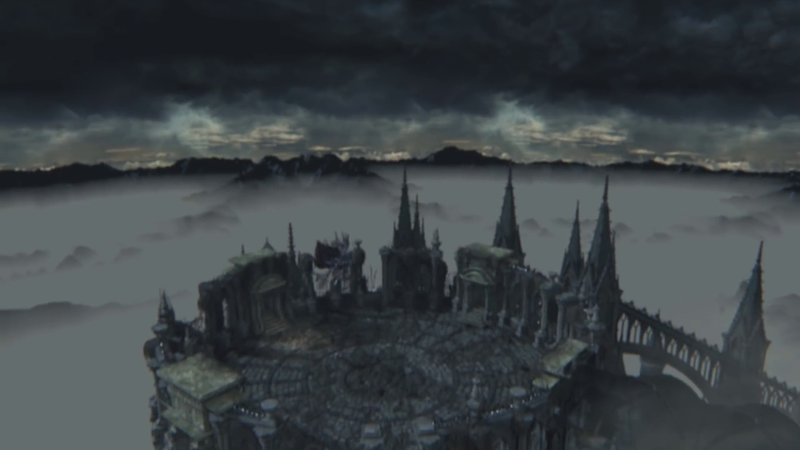 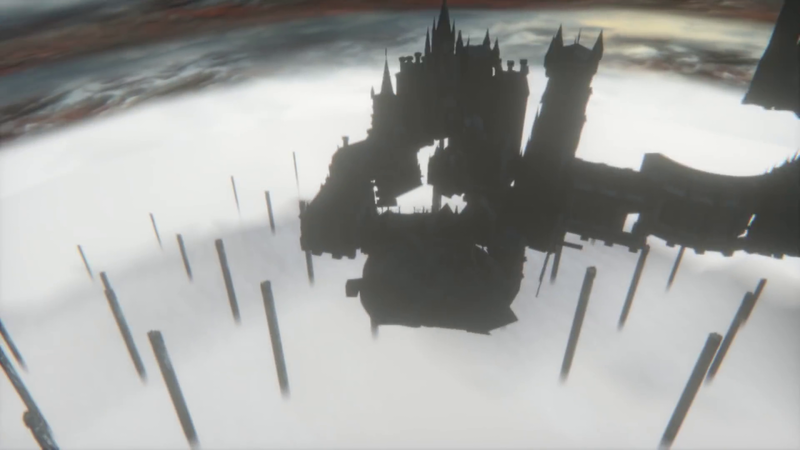 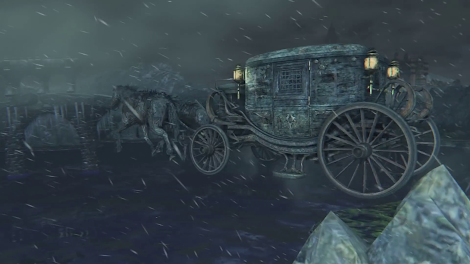 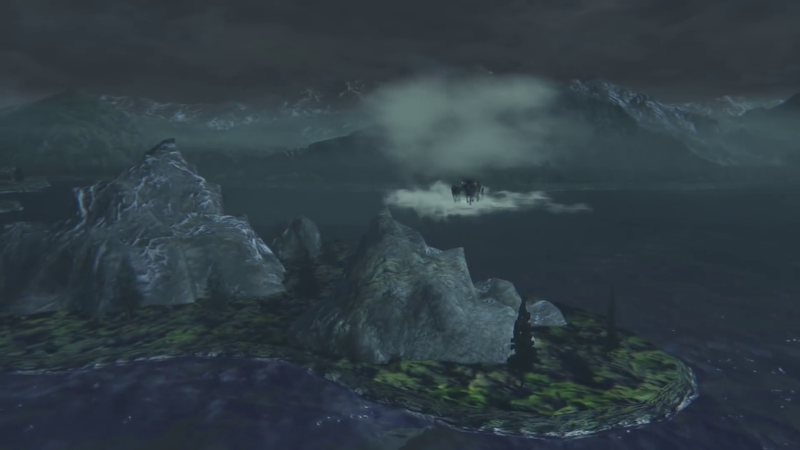 The phantom carriage does, in fact, make the completey journey from Hemwick to Cainhurst along an invisible road, levitating above the water on a cloud of mist. 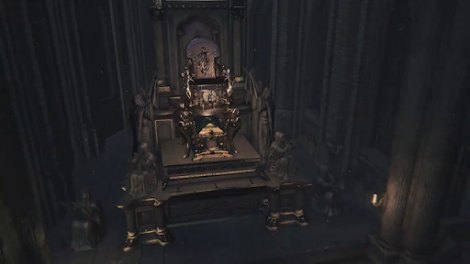 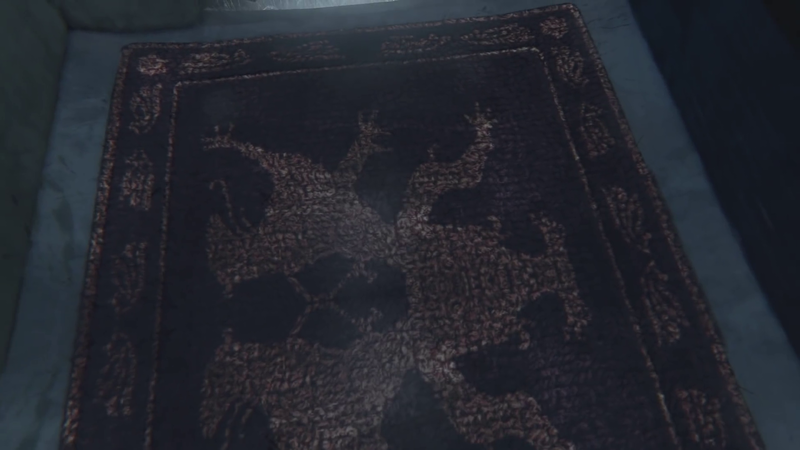 The interior of the carriage has the Cainhurst symbol on its carpet, which is never seen during normal gameplay. 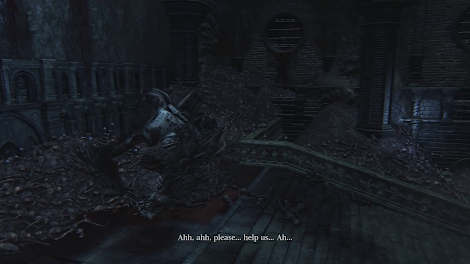 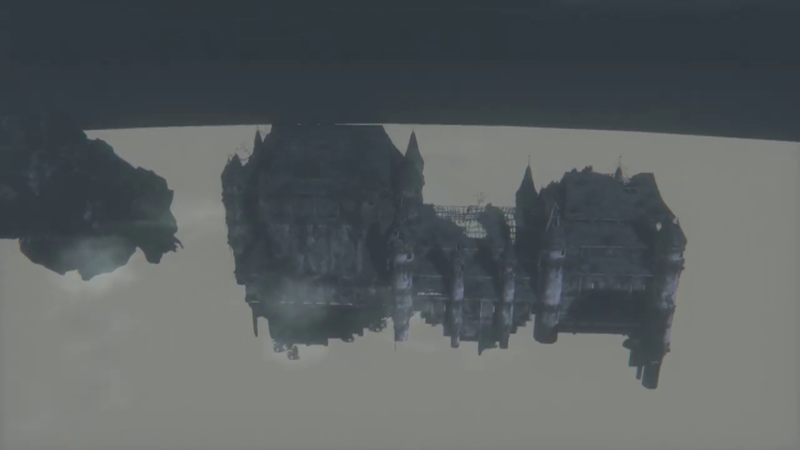 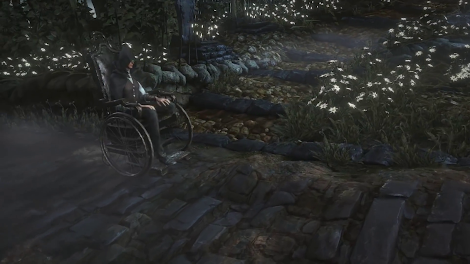 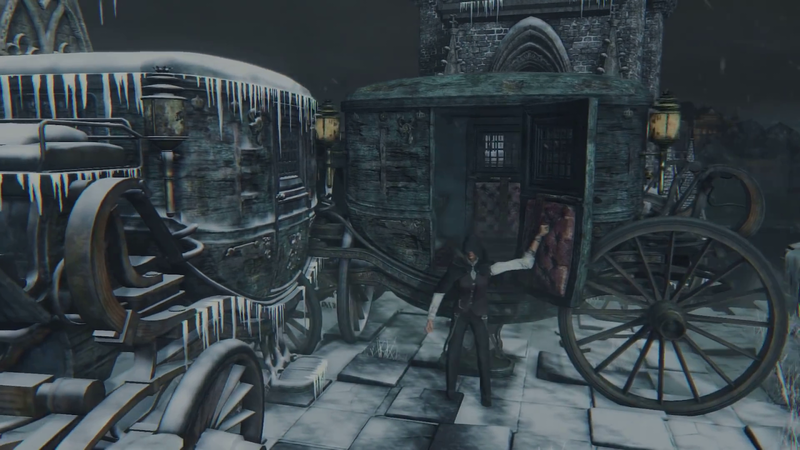 When the carriage arrives at Cainhurst and the player character leaves, there two carriages present, and the carriage the player leaves is perpendicular to the carriage which remains on the map. 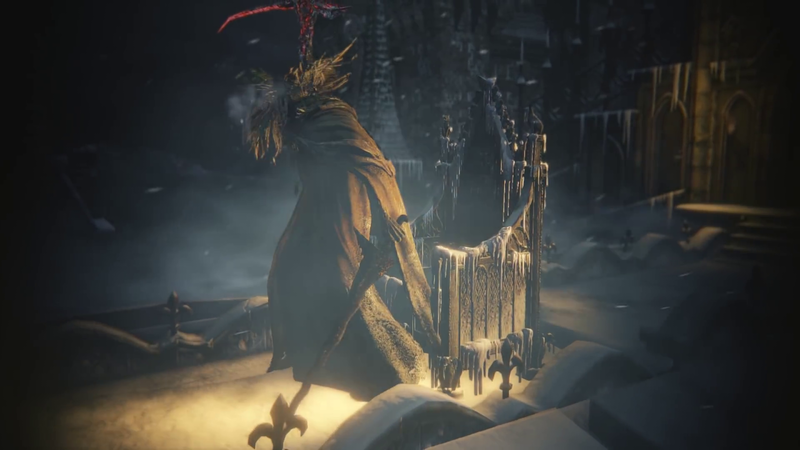 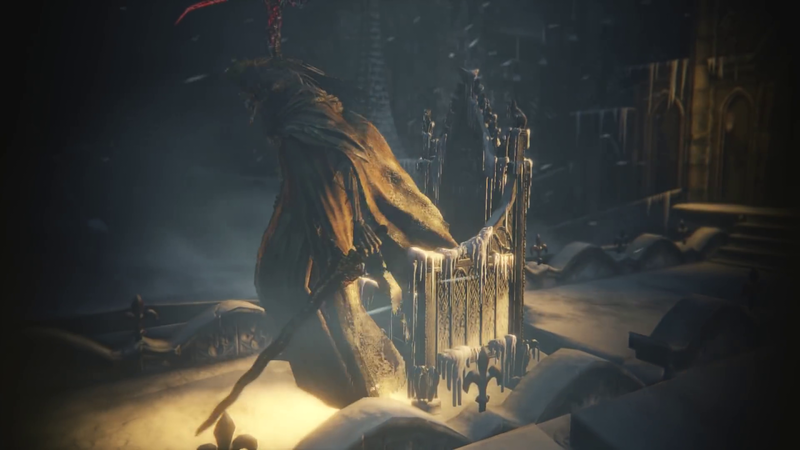 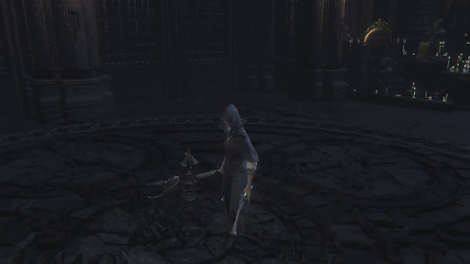 Logarius and his scythe change positions multiple times during the scene of him waking up. 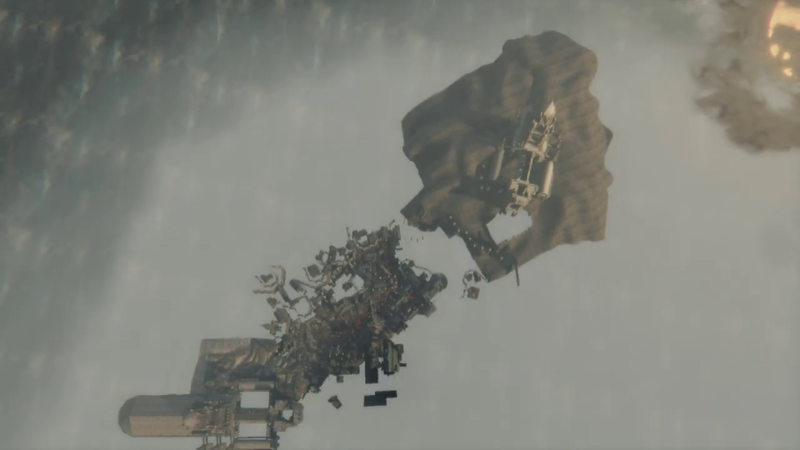 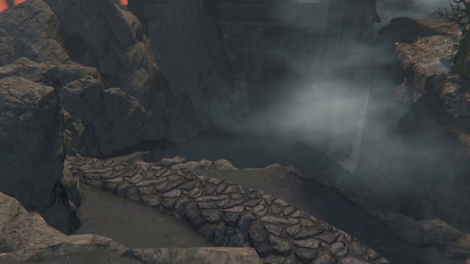 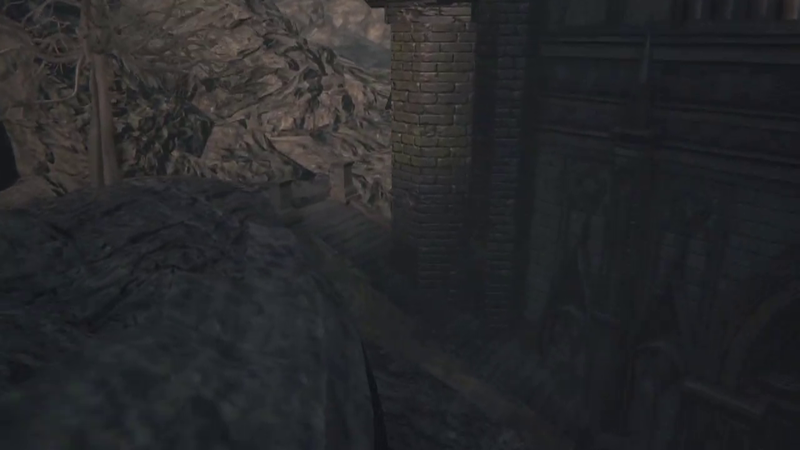 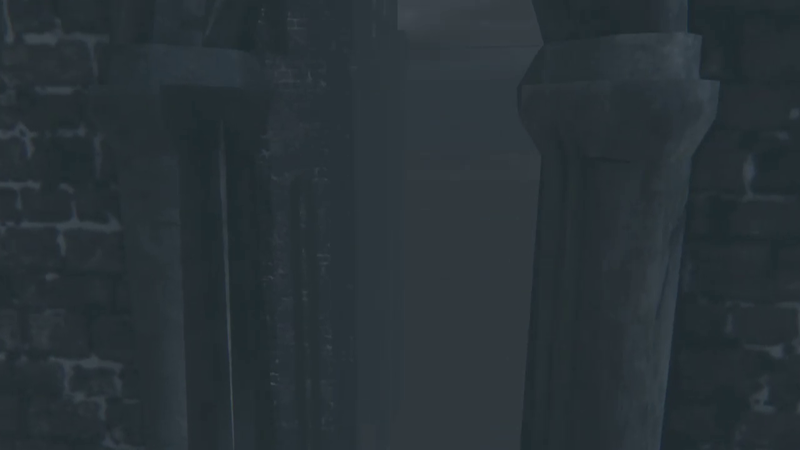 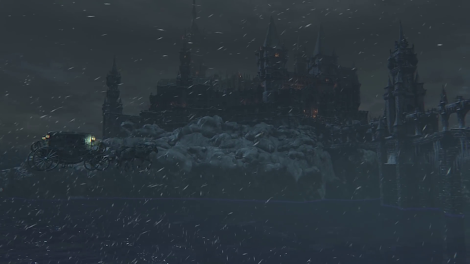 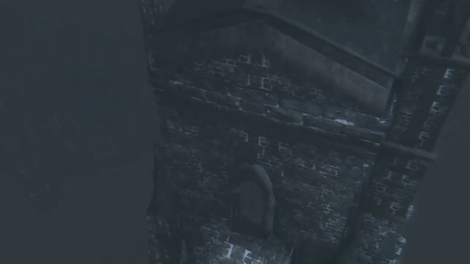 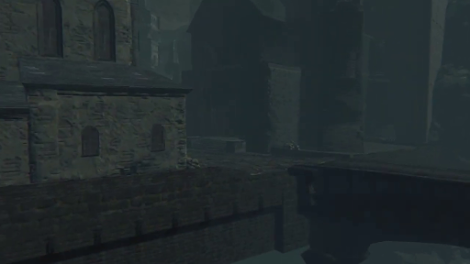 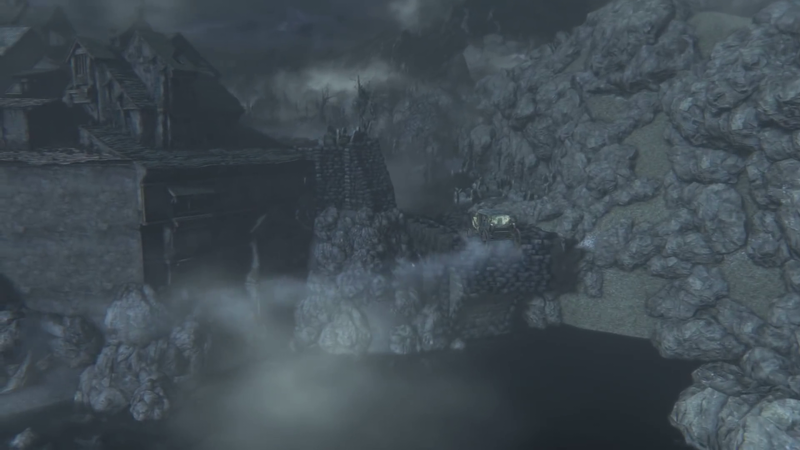 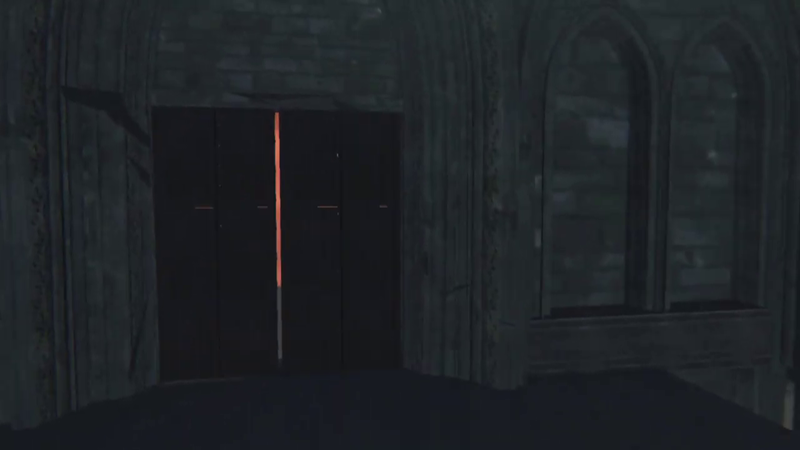 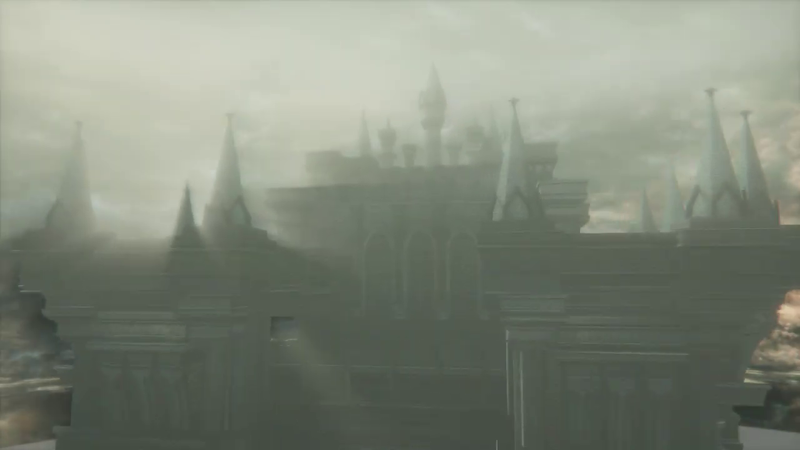 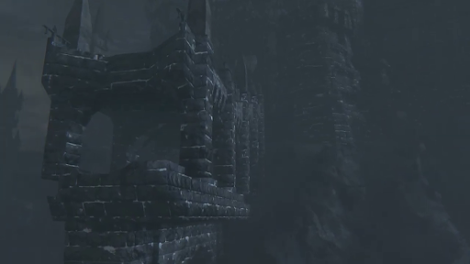 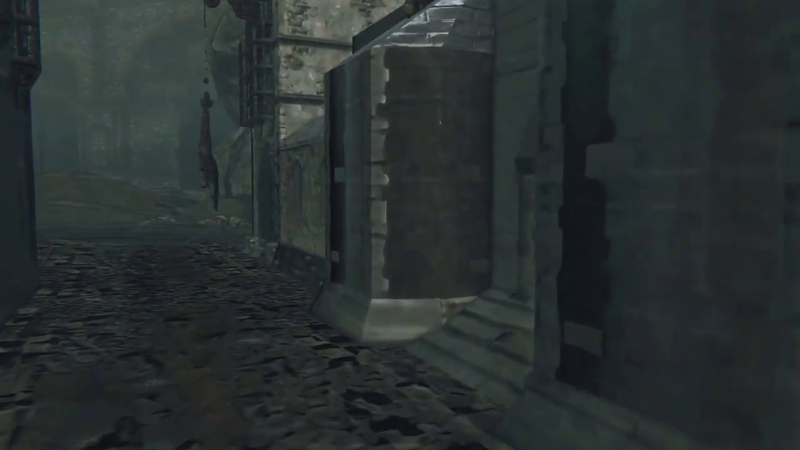 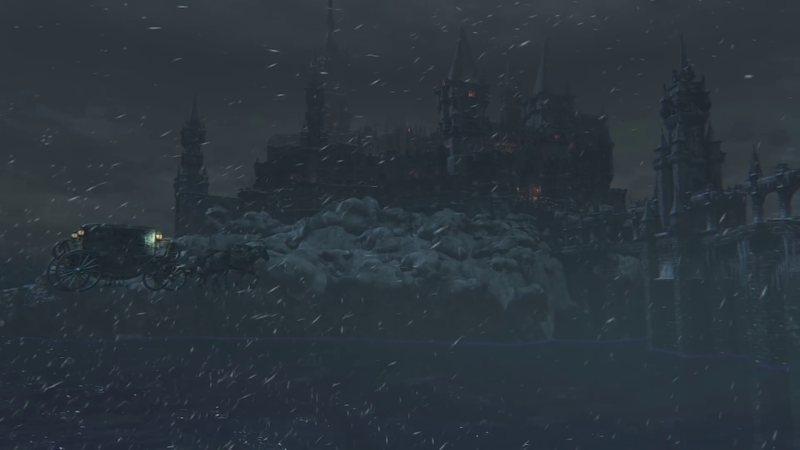 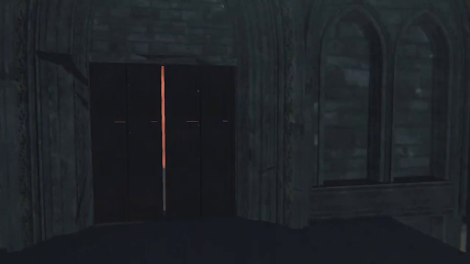 This part of the castle is initially located underneath the map, and is then raised up during the cutscene. 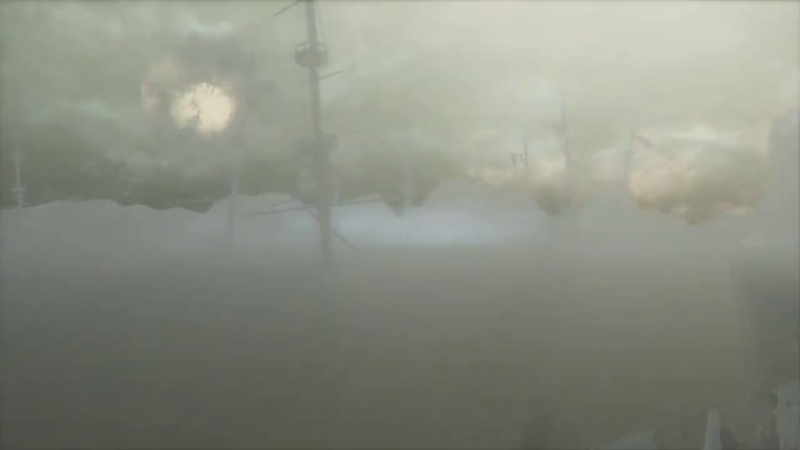 This is obscured by a cloud of mist that surrounds the player character. 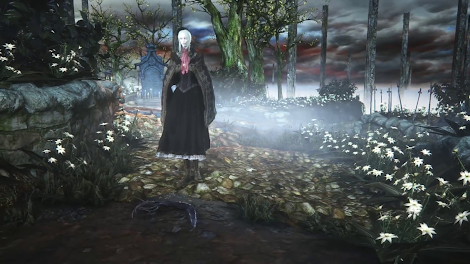 The "Patches" who kicks the player character into the poison swamp in the Nightmare Frontier is the red glowing version summoned by Bell Maidens rather than Patches himself. 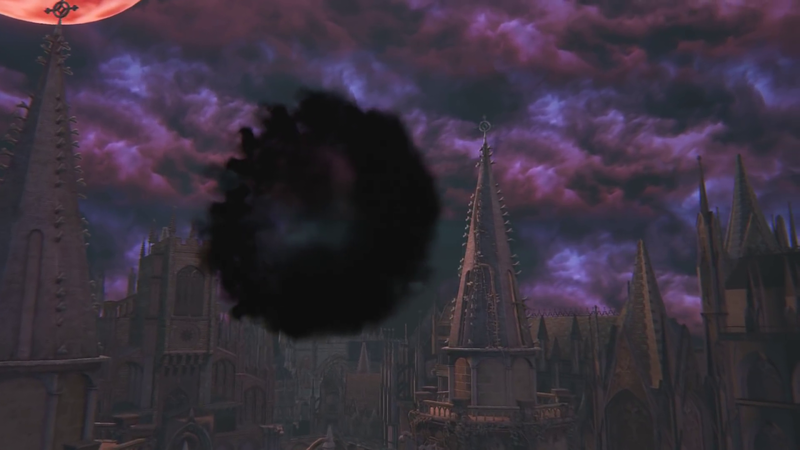 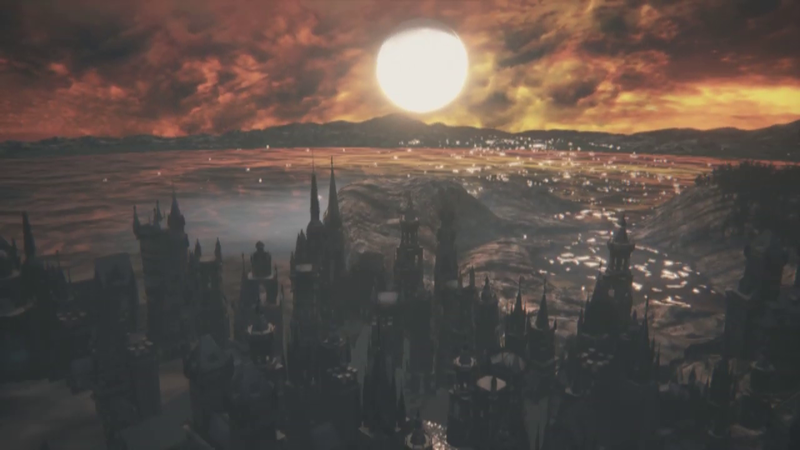 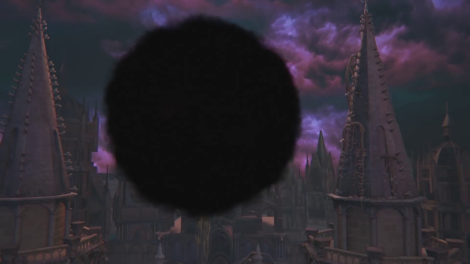 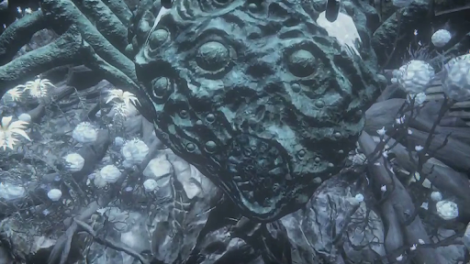 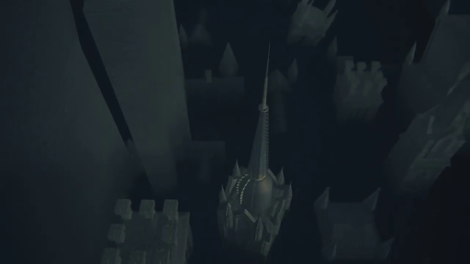 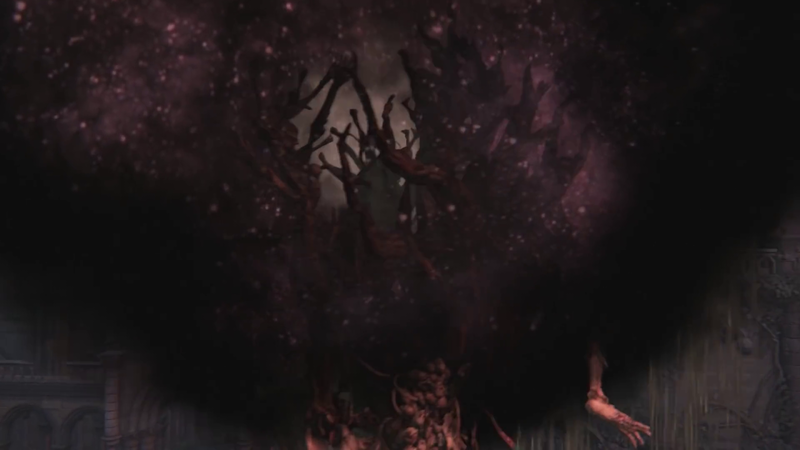 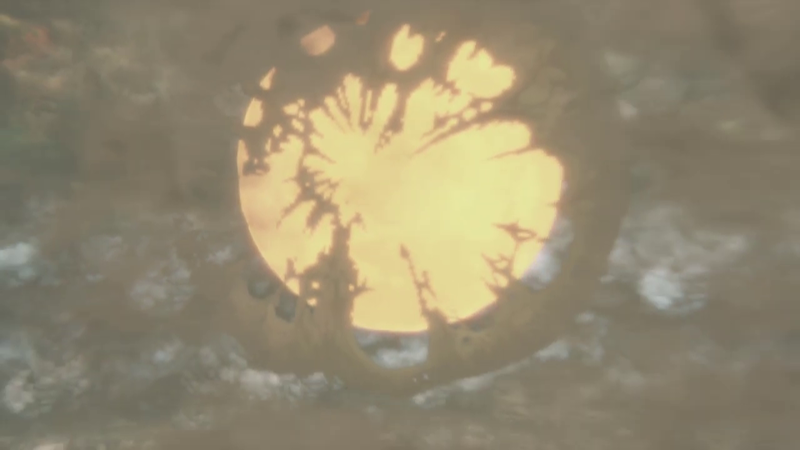 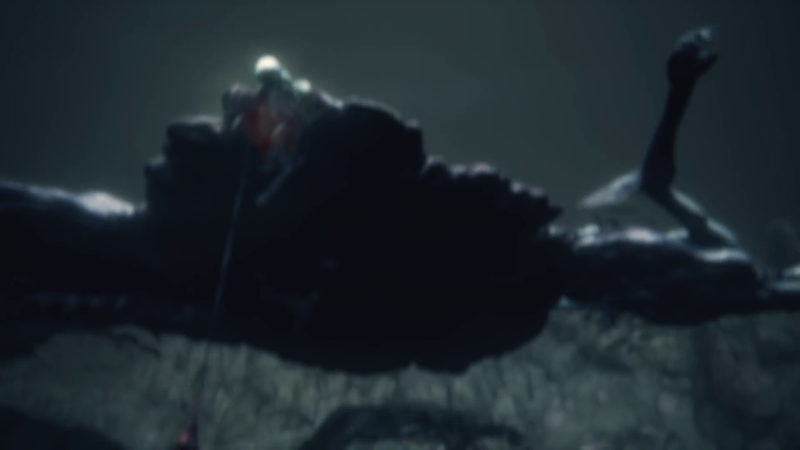 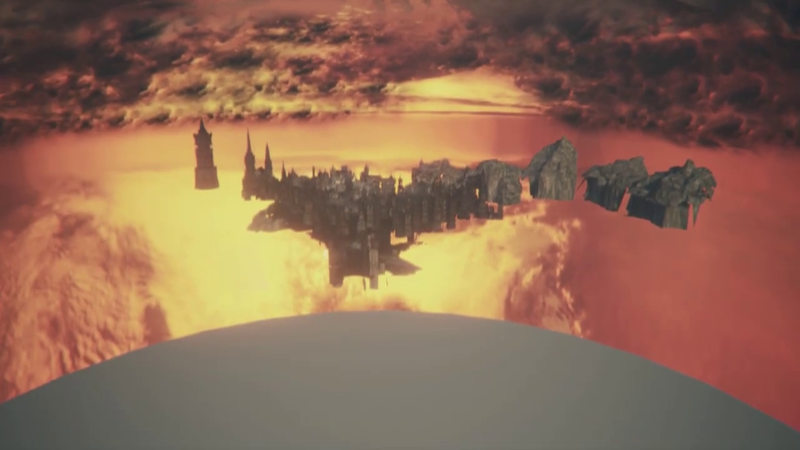 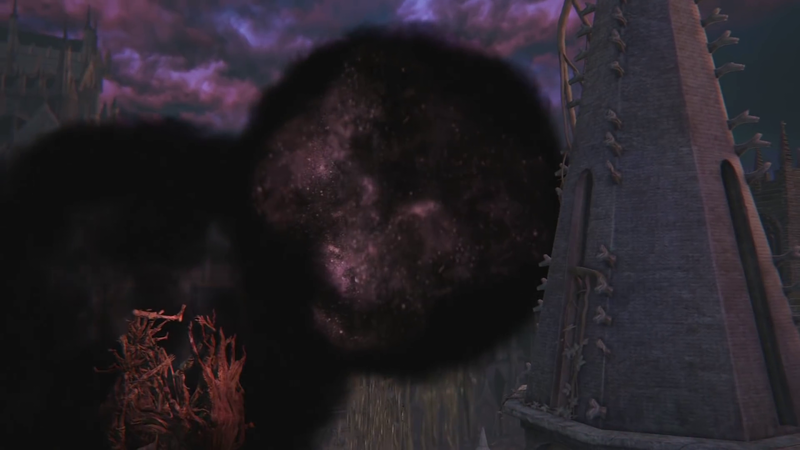 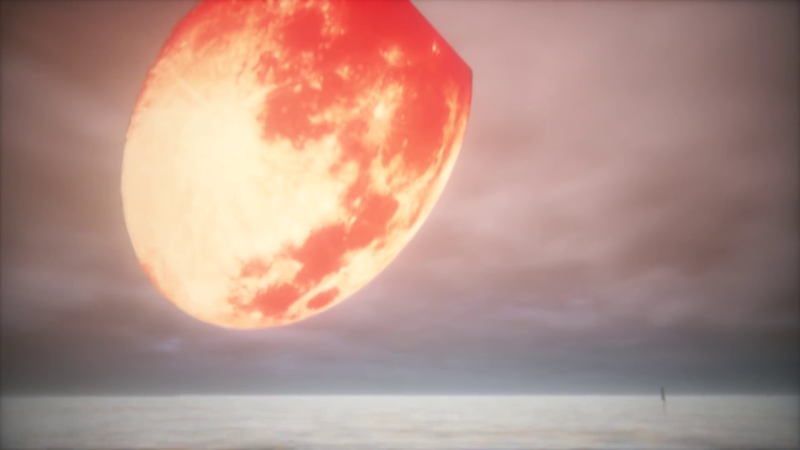 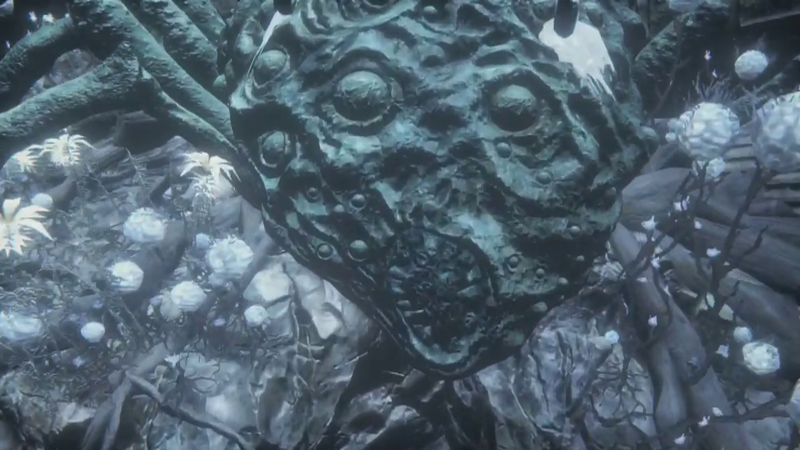 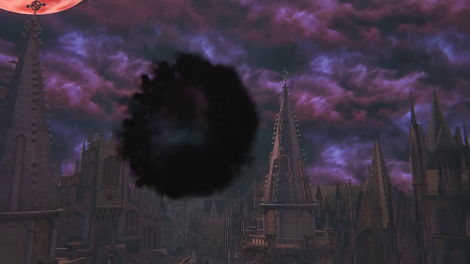 The black mist that The One Reborn appears from is a sphere which forms slightly above Advent Plaza, with the cutscene's camera angle making it appear larger and covering the Red Moon. 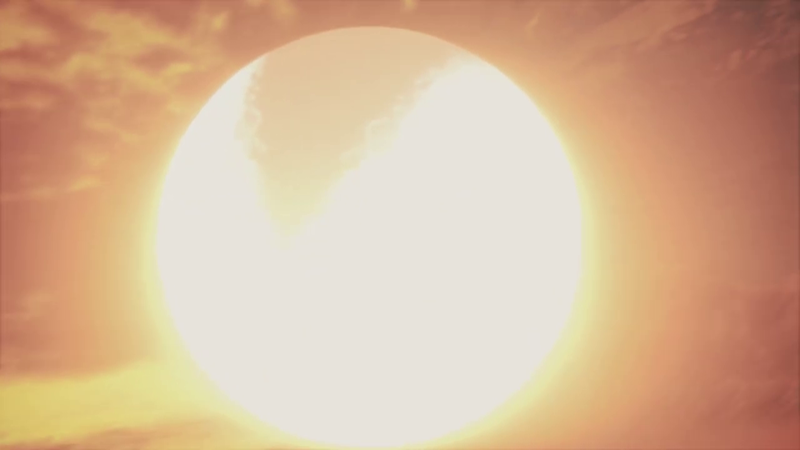 When The One Reborn emerges from the sphere, it does so from a second sphere which forms in front of the first. 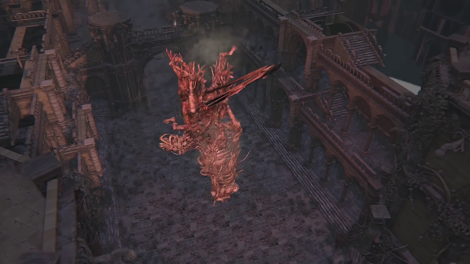 The One Reborn then changes position as it falls down into Advent Plaza. 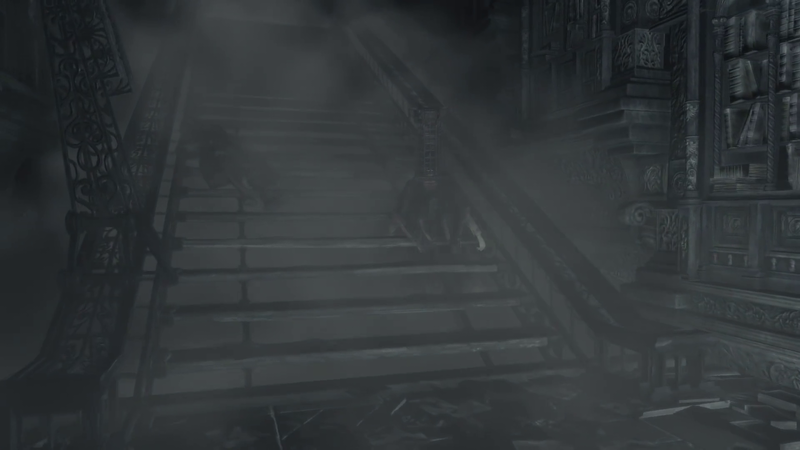 When Micolash turns the corner to walk away from the player character, he moves away through the stairs instead of climbing them. 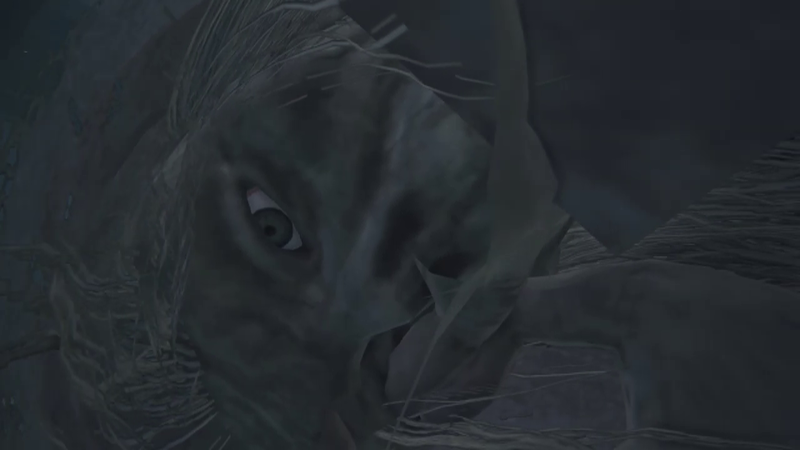 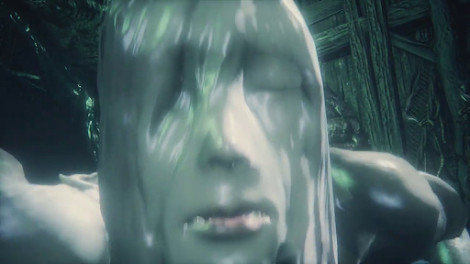 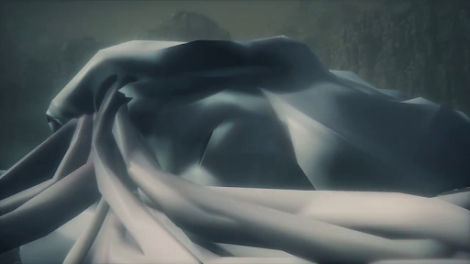 Ludwig appears as soon as the cutscene begins, while the camera is facing the NPC corpse. 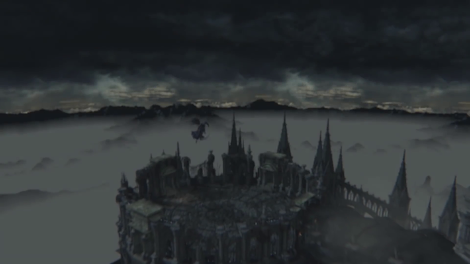 When it is time to reveal Ludwig, a cloud of fog appears around him. 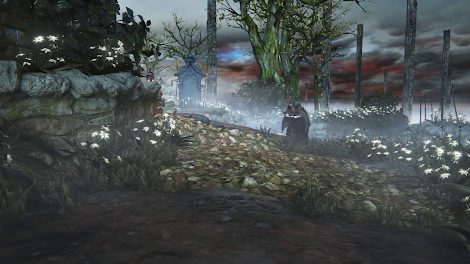 The Holy Moonlight Sword appears from under the map when Ludwig is required to grab it. View of the Surgery Altar cutscene from the opposite angle. 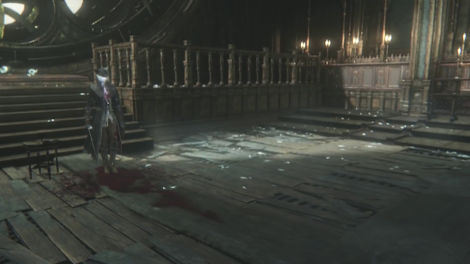 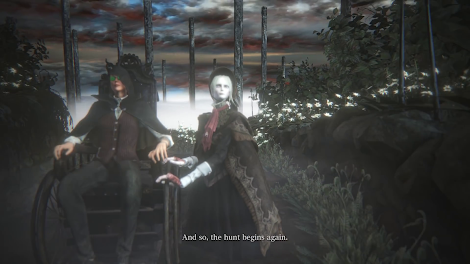 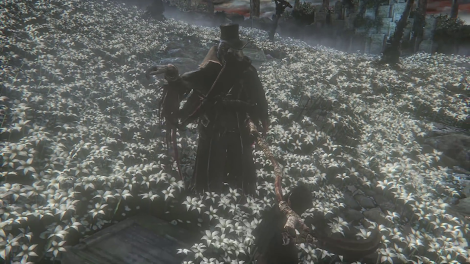 Both the player character and Lady Maria's models change position numerous times as Maria awakens. 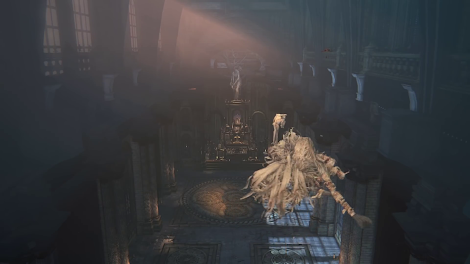 As Maria stands, the player character is gradually moved further away from her in preparation for the boss fight. 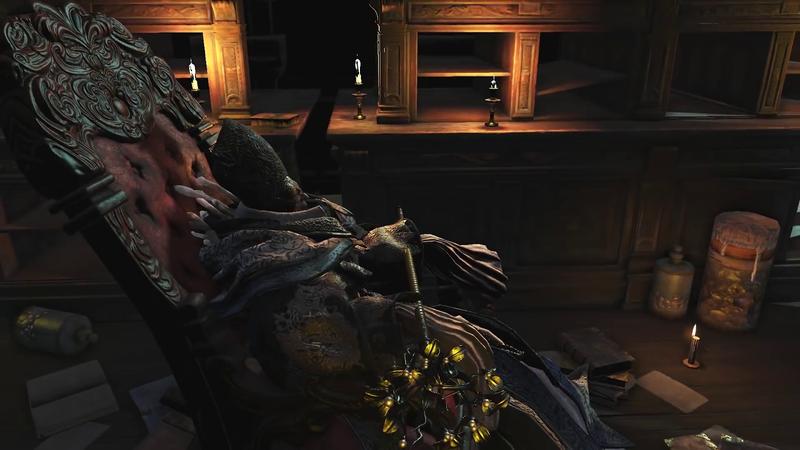 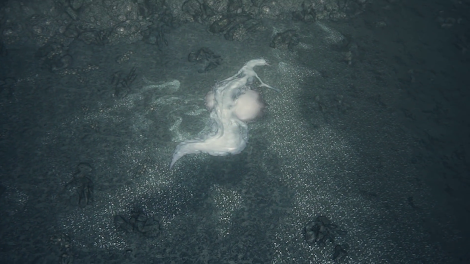 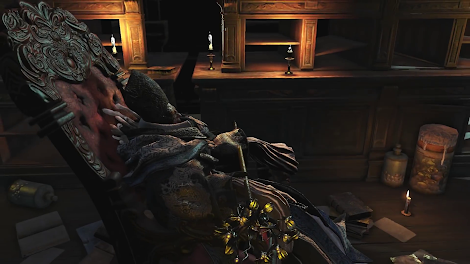 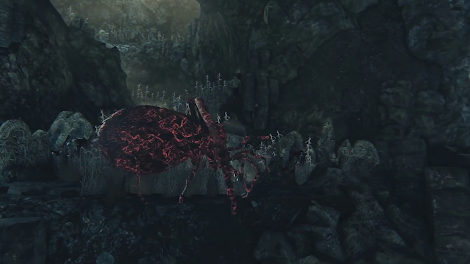 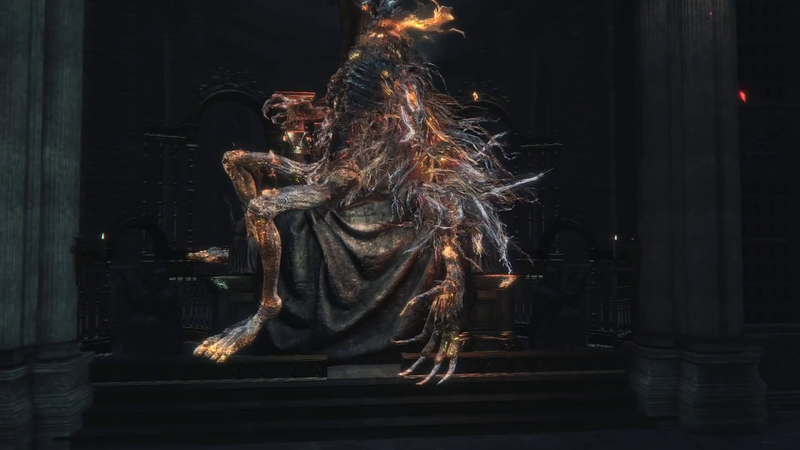 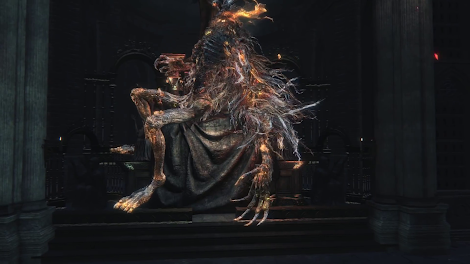 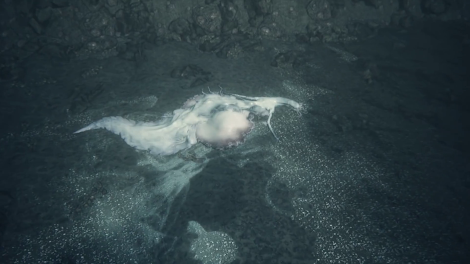 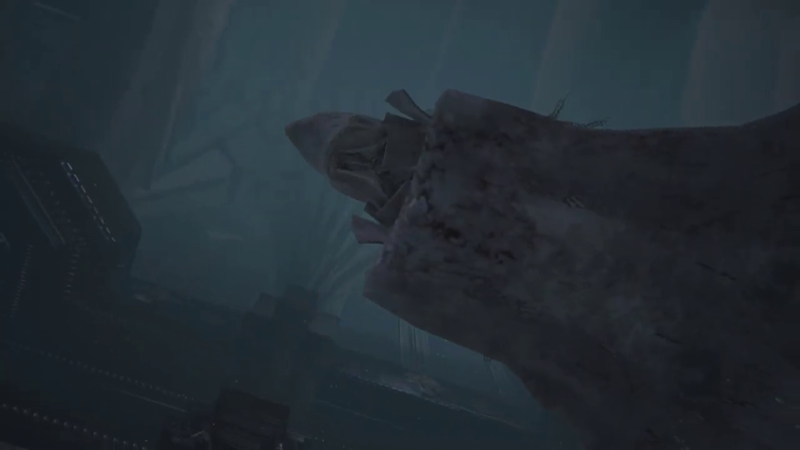 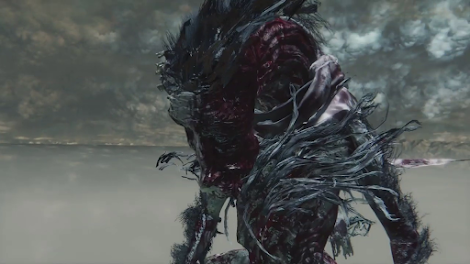 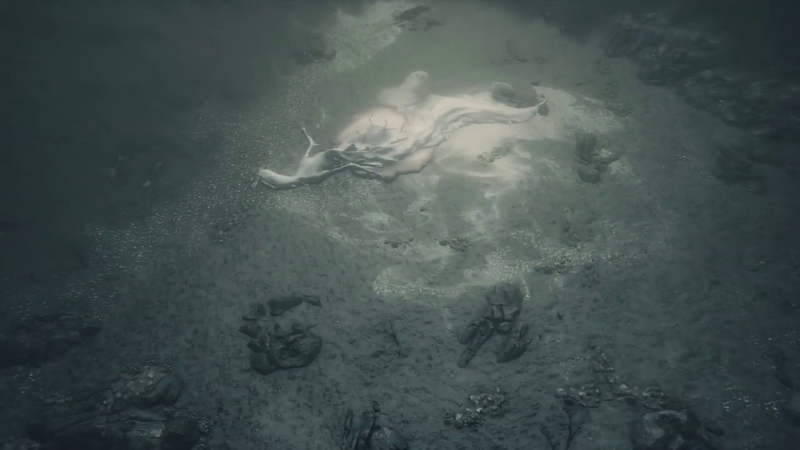 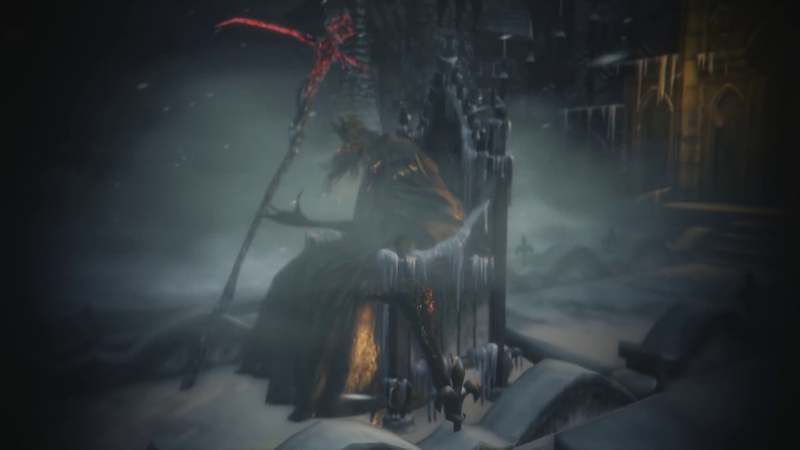 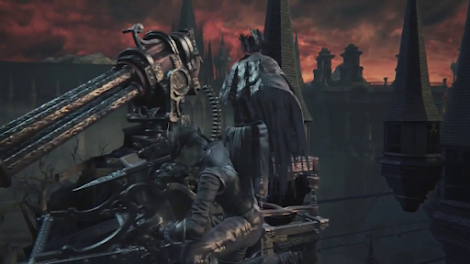 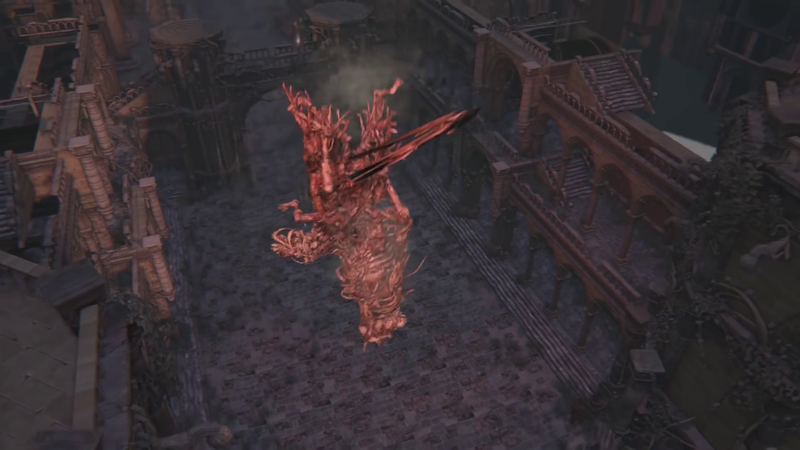 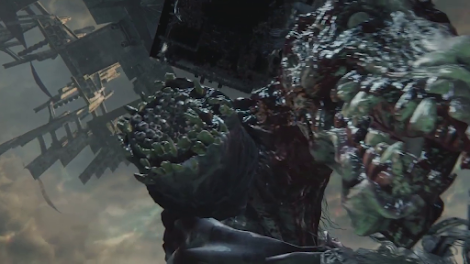 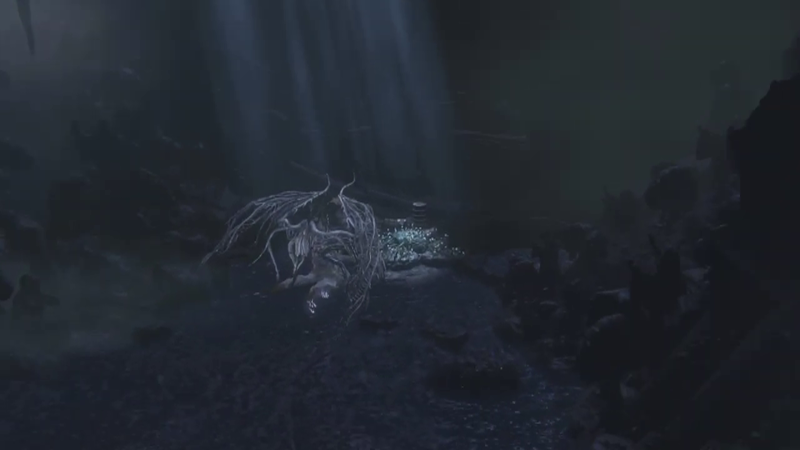 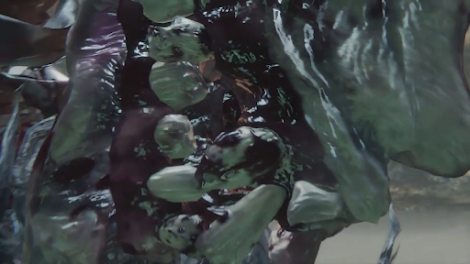 The position of Kos' corpse changes depending on the camera angle, and the Orphan's weapon hangs down below the ground. 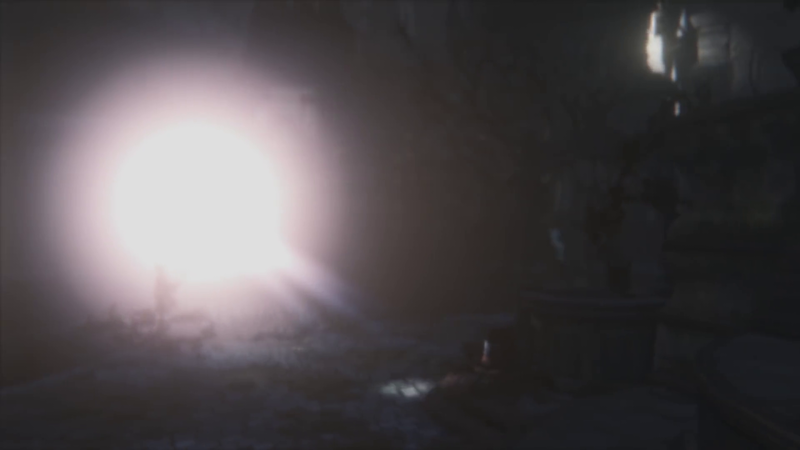 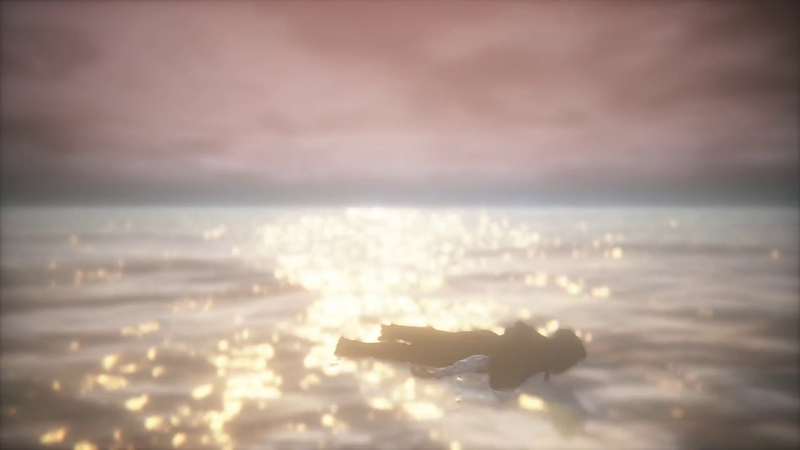 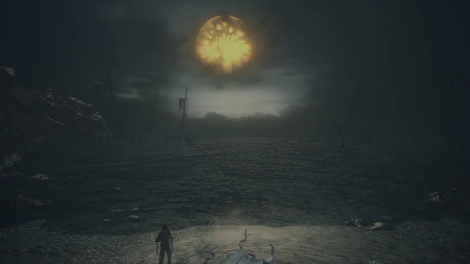 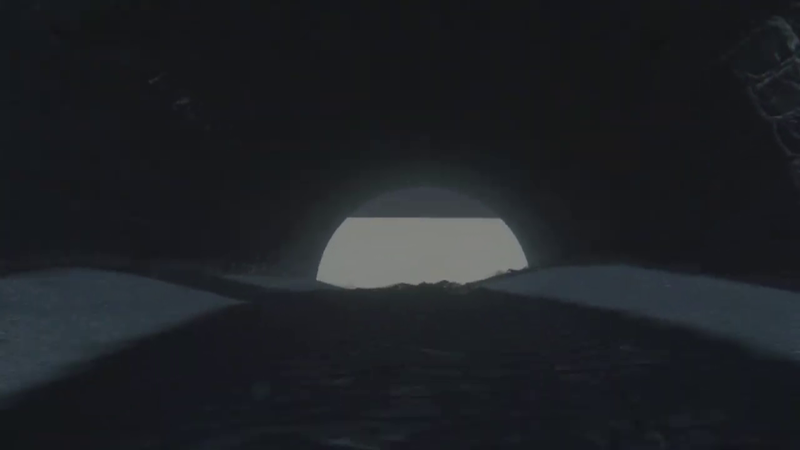 In the scene of the Orphan returning to the sea, the "Sun" disappears when the camera angle changes. 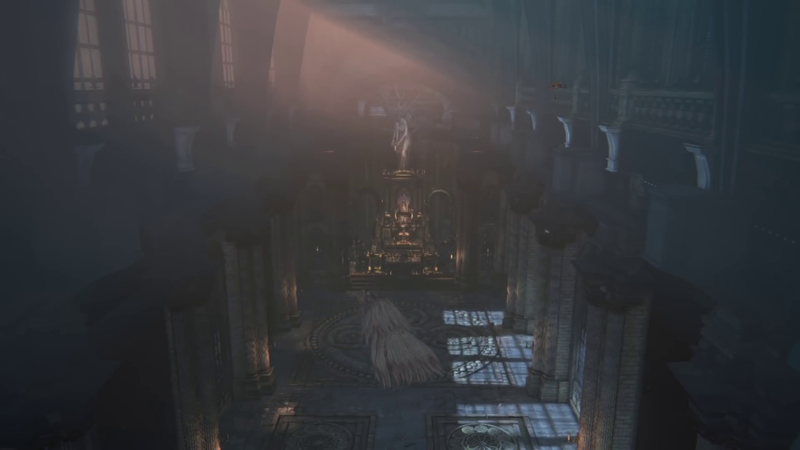 Laurence changes position multiple times before stepping off the altar. The Wet Nurse begins floating above the arena before dropping down onto Mergo's pram. Gehrman's model and position change as he prepares to decapitate the player. His weapons and arms also contort in impossible positions. 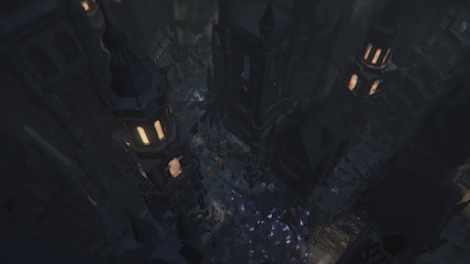 Similar to the Byrgenwerth flashback, the Cathedral Ward seen in this ending is a partial copy of the real Cathedral Ward, located out of bounds in the Hunter's Dream map. The sunrise light source changes position depending on the camera angle. Freecam allows us to see Gehrman's NPC model being swapped for his boss model. Gehrman's location is also changes depending on the angle. 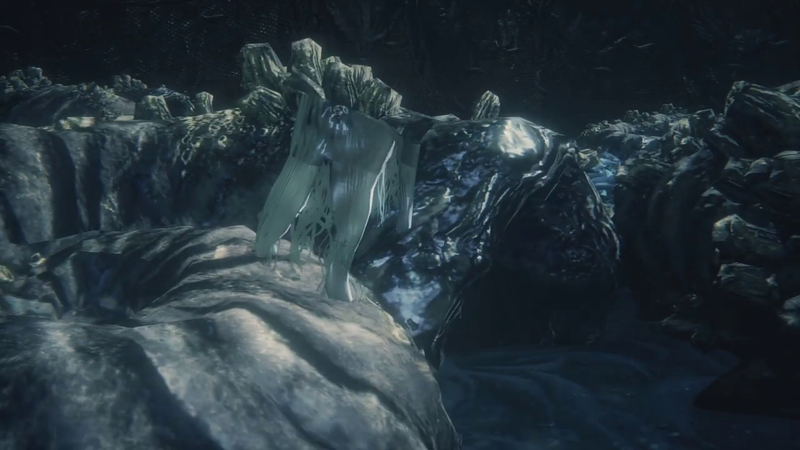 To give the impression that the player character's shin has been removed, their leg is folded back inside the model at the knee. 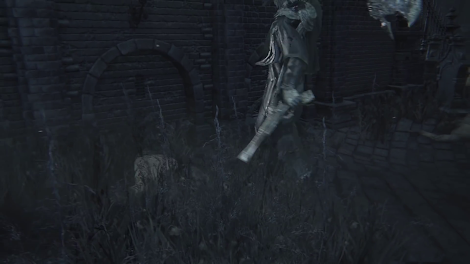 It returns to its usual position when not in shot. 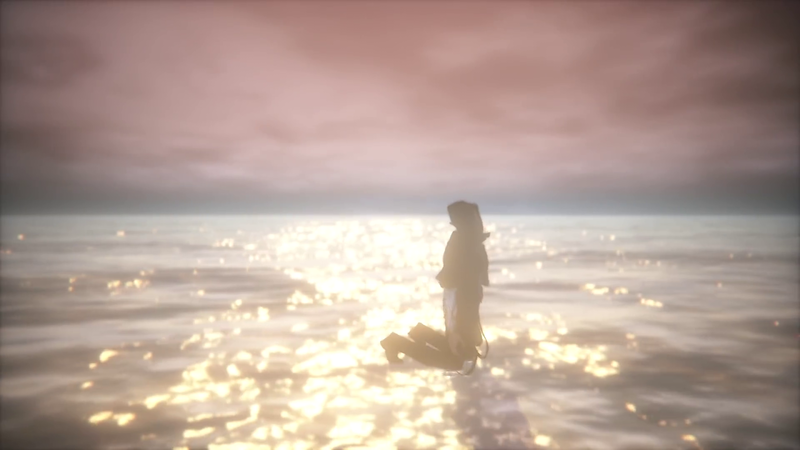 The player character's Great One form and the Doll are both initially near the Messenger's bath. 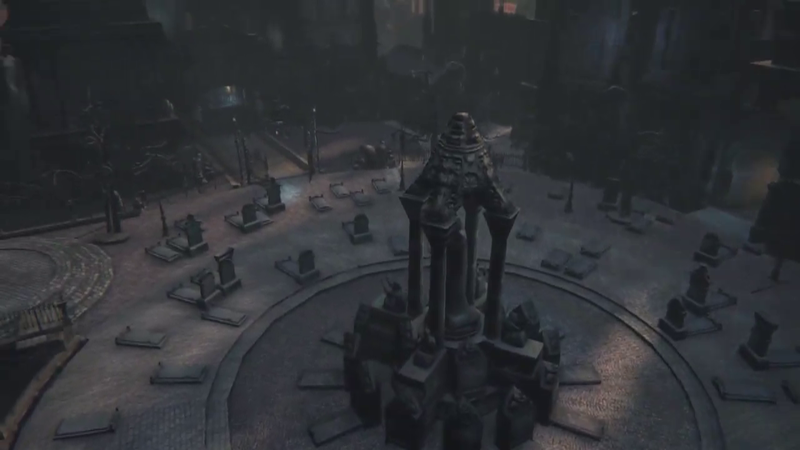 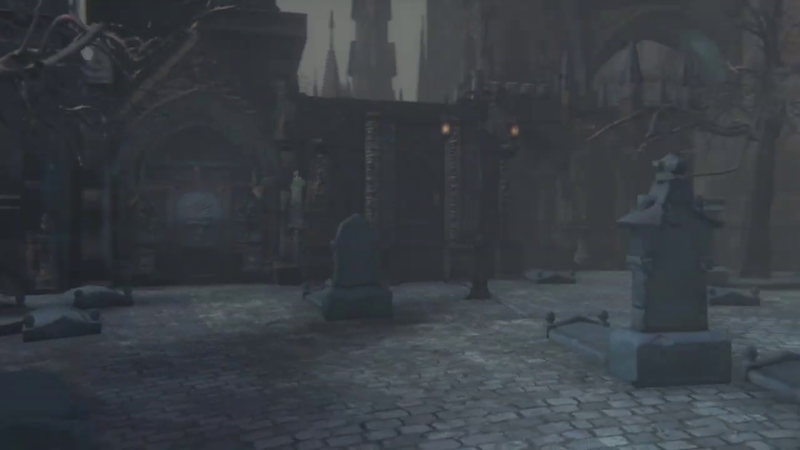 During the camera angle change, they move closer to the awakening headstones.